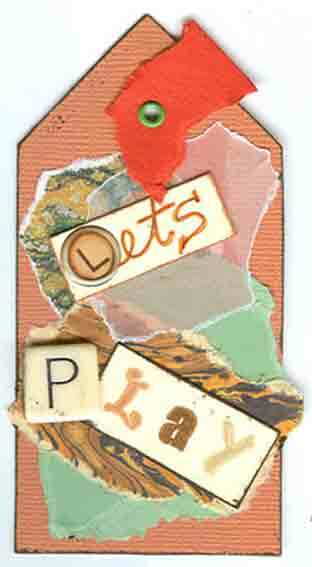 Lucky Charm Crafts Paper Playground Class Schedule. 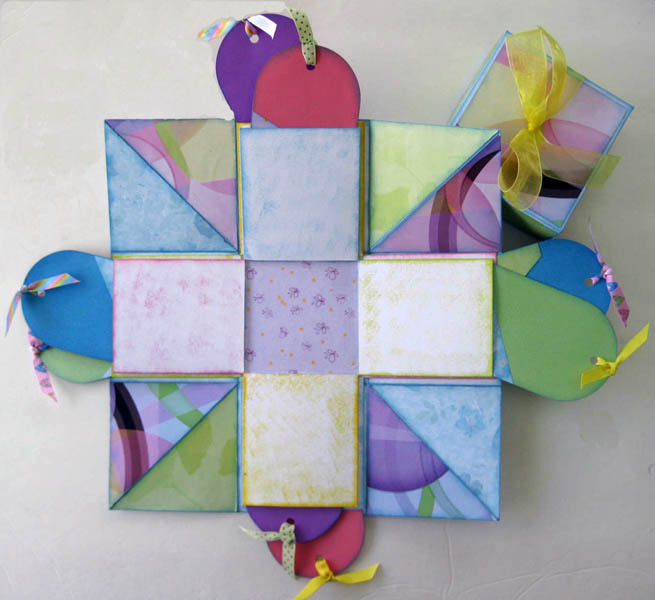 Join the Paper Playground for hands-on, make-and-take, paper craft fun! 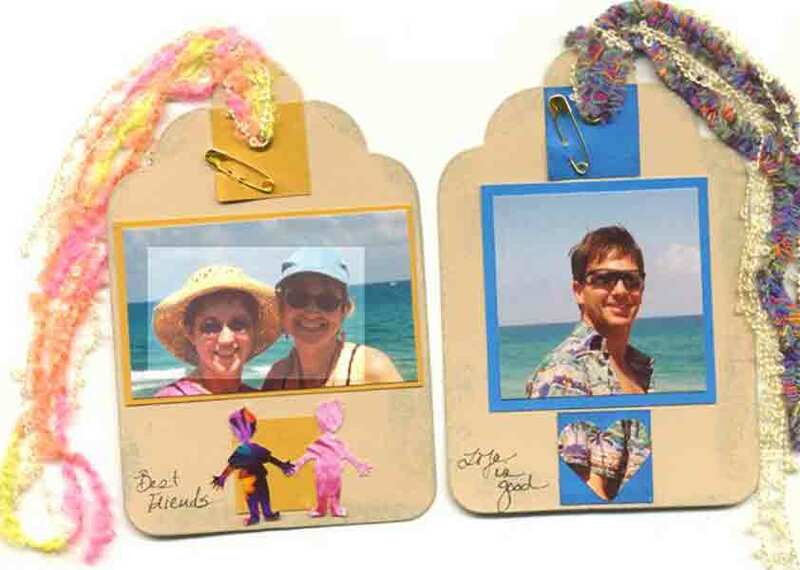 Become a member of our monthly club and join us for hands-on scrapbook and paper craft workshops at our Studio in Wellington, Florida or at the Boynton Lakes Clubhouse in Boynton Beach, Florida. 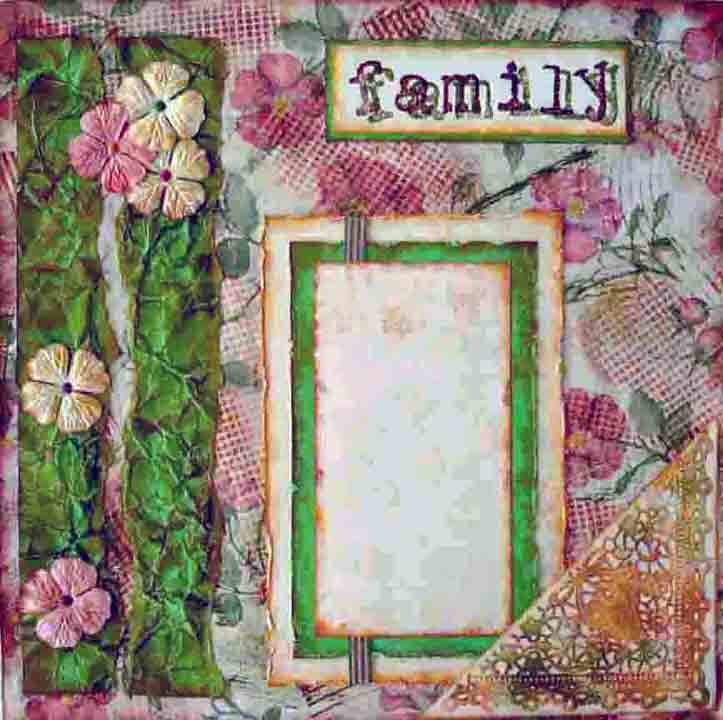 We are also available for private scrapbooking and card making parties at your home or office, where we’ll teach a workshop of your choice below. 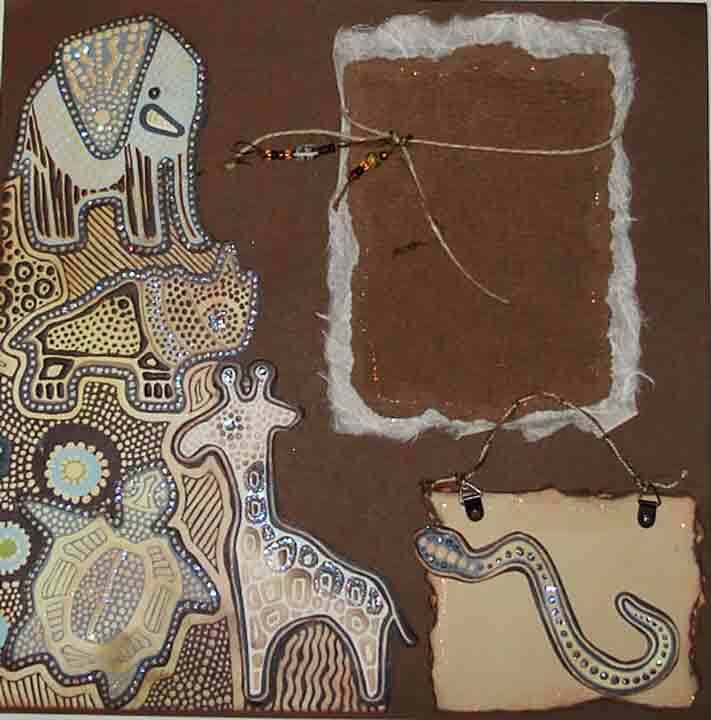 As a Paper Playground participant, you’ll receive a project kit, designed by Lynn, which includes pre-scored and cut papers, embellishments, tools, hands-on instructions on how to make beautiful paper crafts and an instructional video, when available. 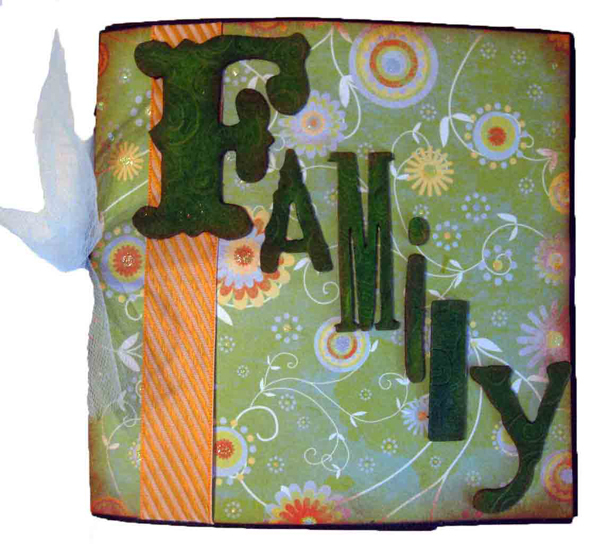 Please see below for our current class schedule and class ideas, or contact us to schedule a private scrapbooking party at your home or office. 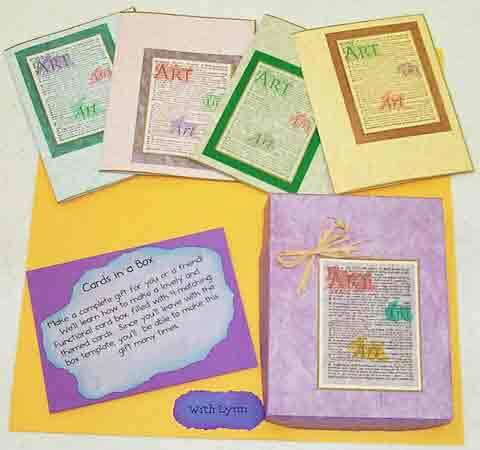 Create the Book of your Life using a single paper bag and one piece of cardstock. 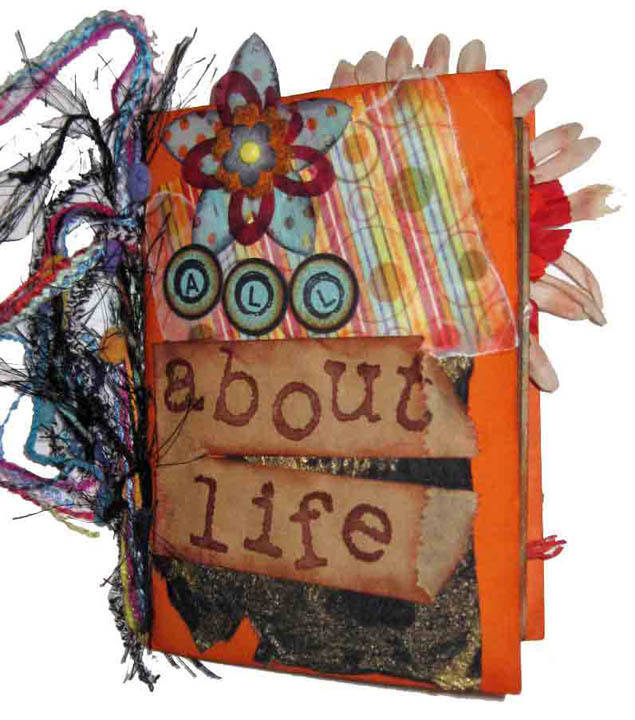 We'll add ink, die cuts, stickers, cork, paper, fibers, beads, pockets, clips and other fun embellishments into one 8-page paper book, depicting your favorite things in life. 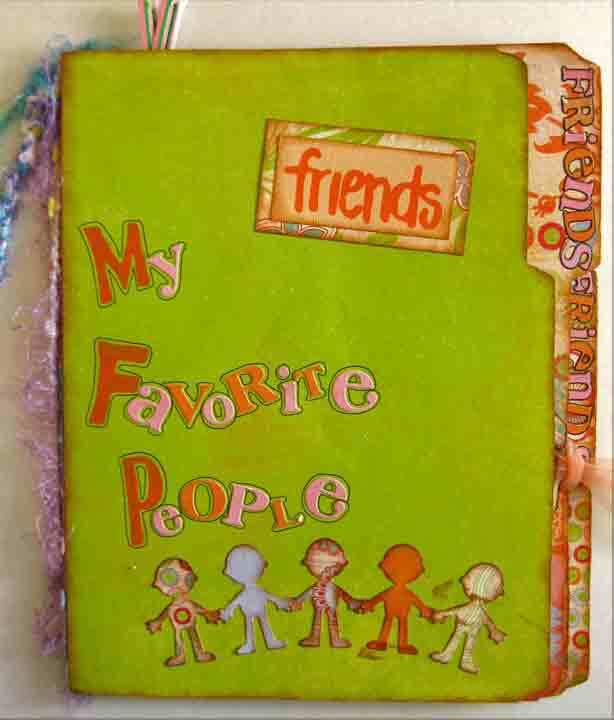 Make a beautiful and sturdy journal/book with 5 "signatures" and 60 pages. 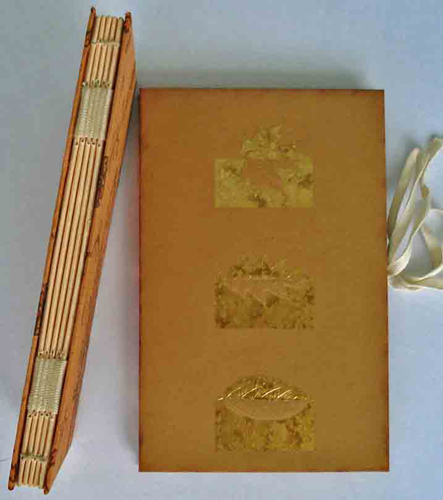 You will learn how to make a professional quality, well bound book. It's great to use yourself or give as a gift. 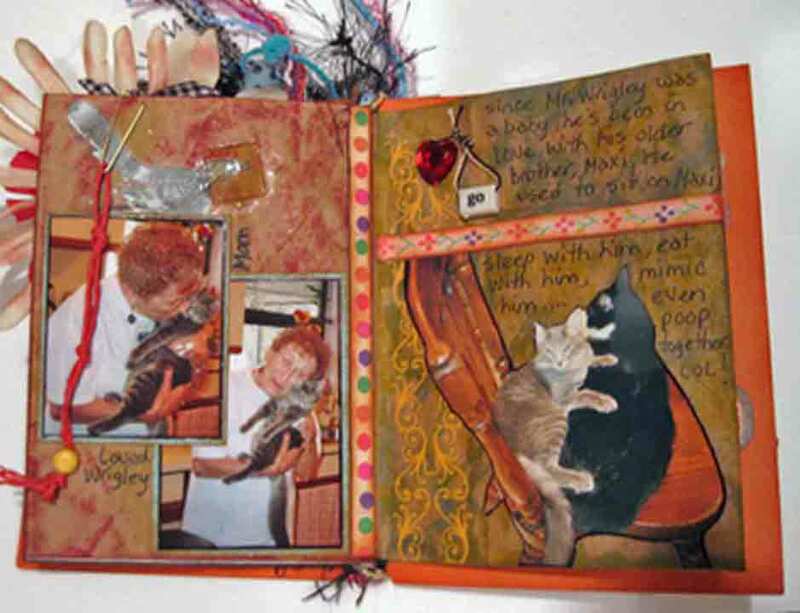 This awesome 2-page layout uses an interactive approach, allowing you to display multiple photos (15 photos) easily in addition to having lots of room to journal and tell your story. It's a super fun project too. 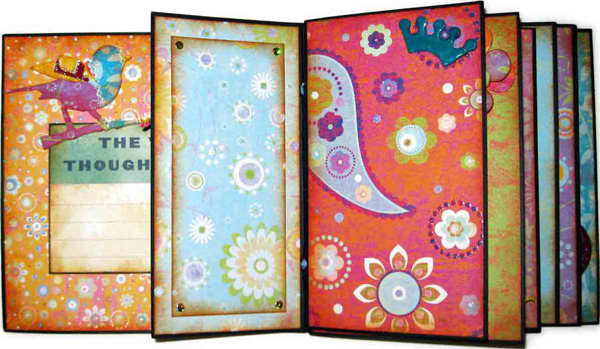 The 2 pull-outs are fabulous, but so are the tri-colored border & letters and the journal pocket. You thought the Explosion Book was exciting? Wait until you see this! It's the most fun project since ever! 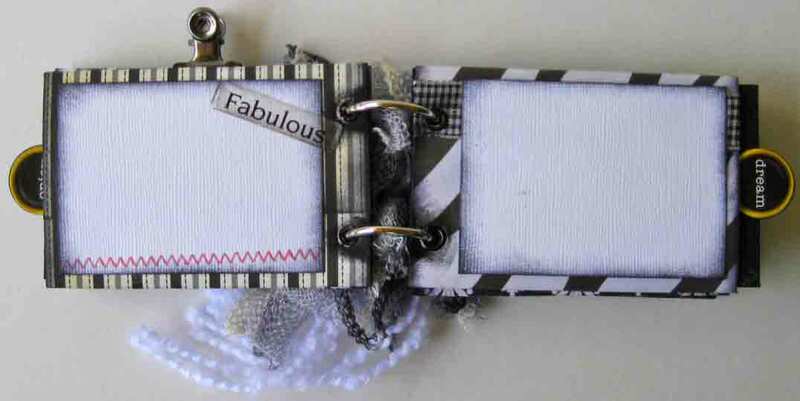 You'll use lots of Basic Grey patterned papers and Bazzill cardstock, full sheet (2 colors) sticker alphas, die cuts, tags and fibers to make a really fun 6-page folder book. 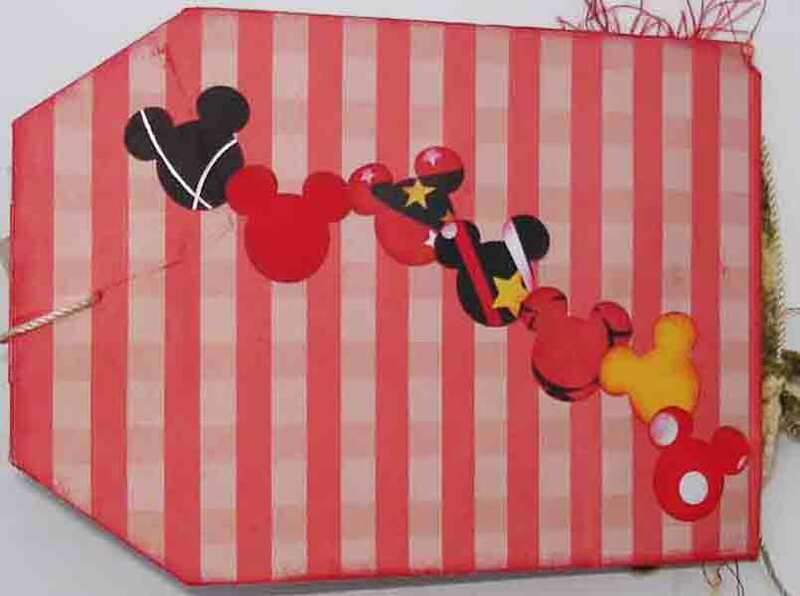 You'll need extra permanent adhesive for this project. 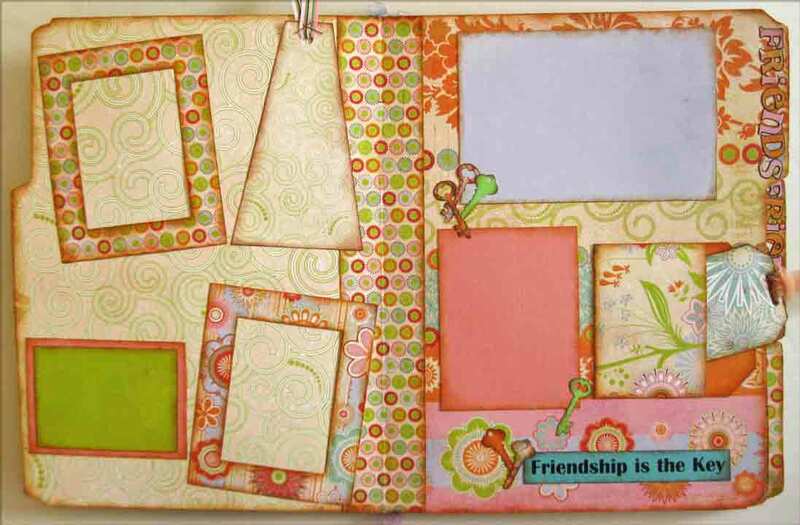 This is a great 1-page layout using either Core'dinations or Bazzill cardstock and patterned papers. 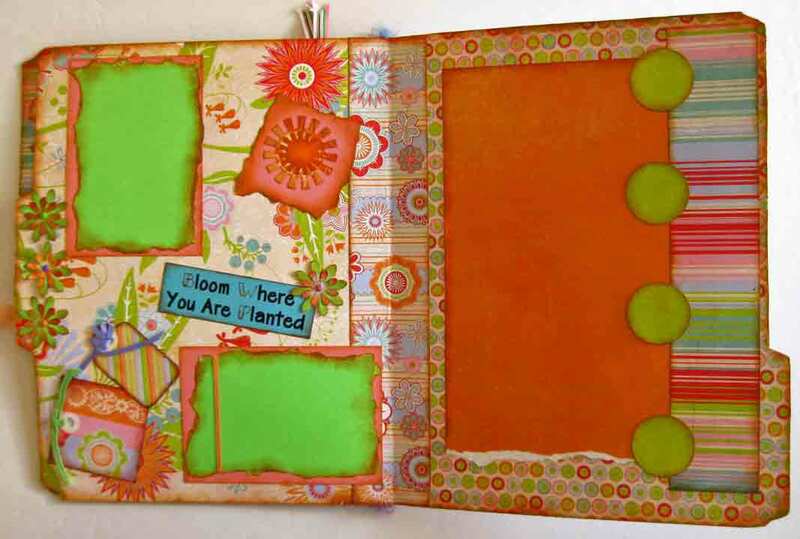 The explosion page allows you to include up to 9 photos or journaling spots on your page. 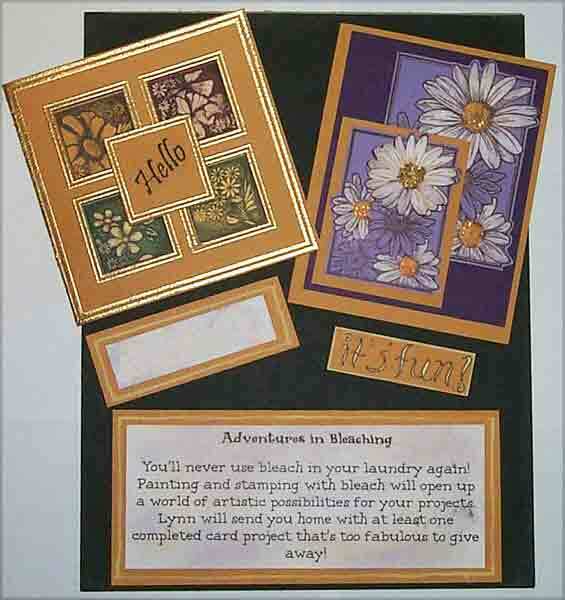 In addition, you'll make adorable scalloped flowers and learn a few distressing techniques. 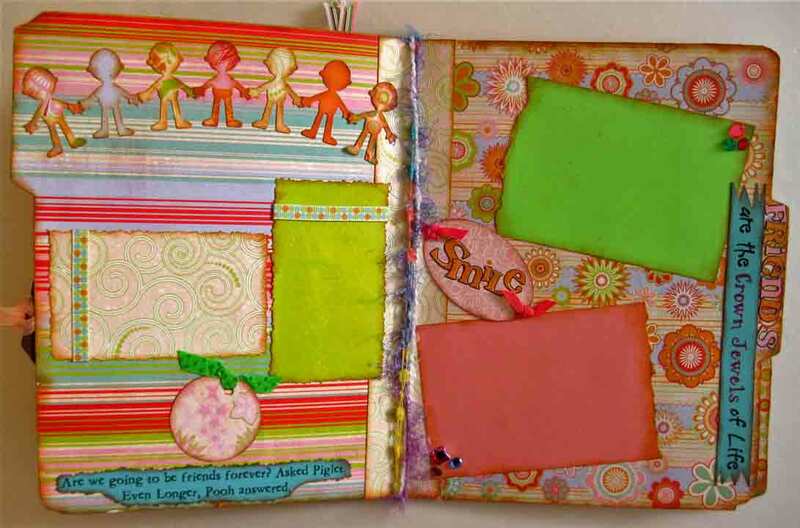 Make a fabulous 2-page layout including many different kinds of pockets, envelopes and sliders. 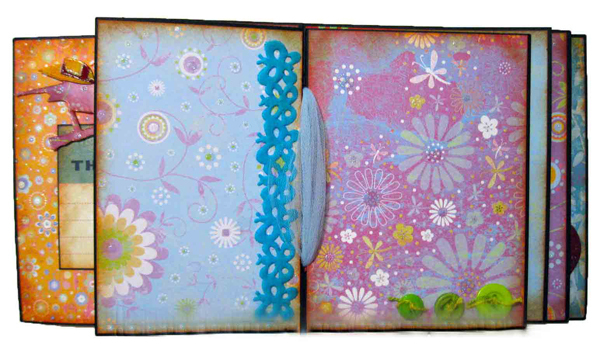 You'll use Double Mates double-sided paper, Prima flowers and beads as embellishments. This is a really fun project and comes with 5 templates you can re-use over and over. One of them makes the cutest little bag! 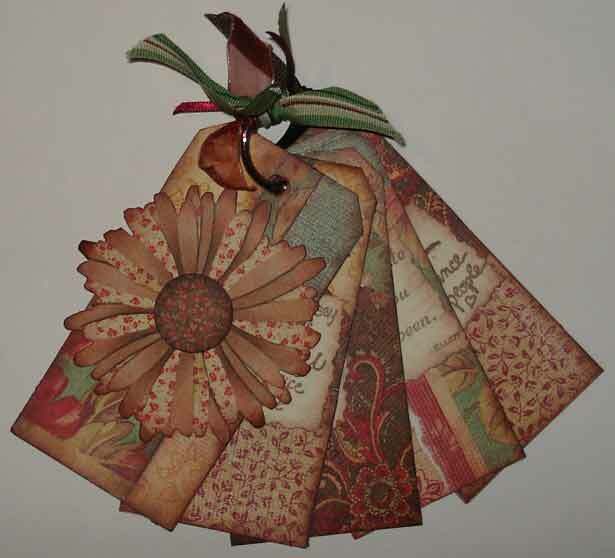 You'll learn all different ways to "vintage" your pages. A class on distressing! My all time favorite technique! Your creative juices will be released and you won't believe how exhilarating it will feel! 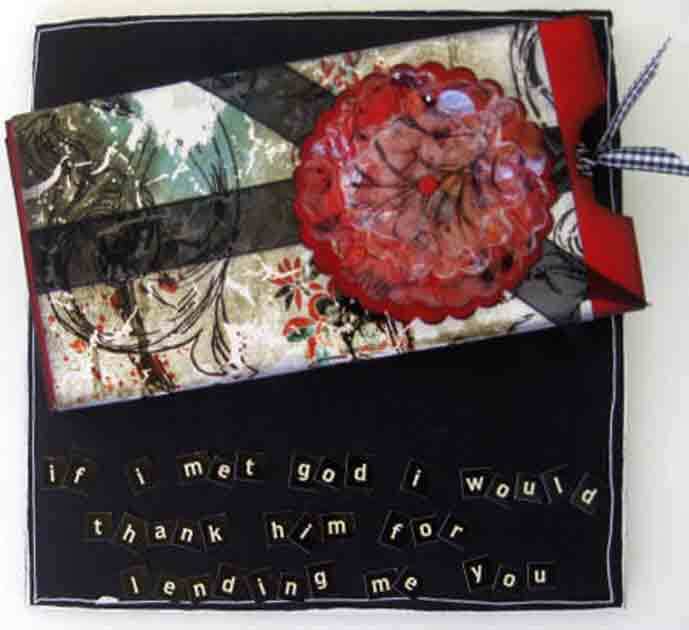 This interactive card is such fun for anyone, but is especially loved by men! Finally a great design that "he'll" enjoy. 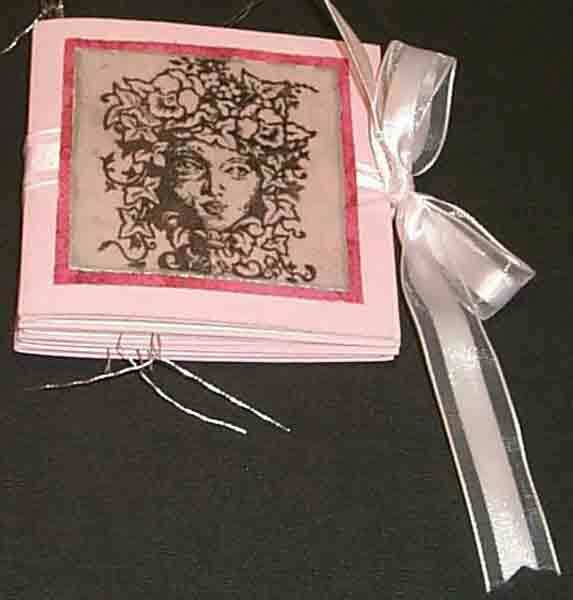 You'll make 2 cards: 1 using a rubber stamp design and 1 using photos. 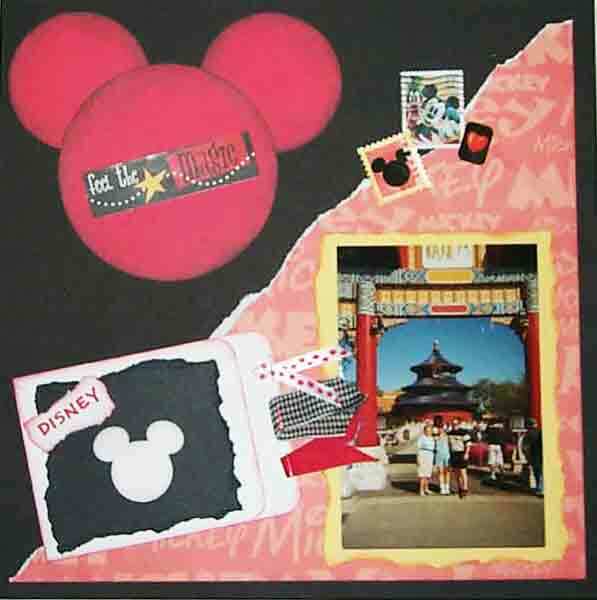 This concept will work great on a scrapbook page as well. You'll need 4 related photos, croppable to 2"x2". 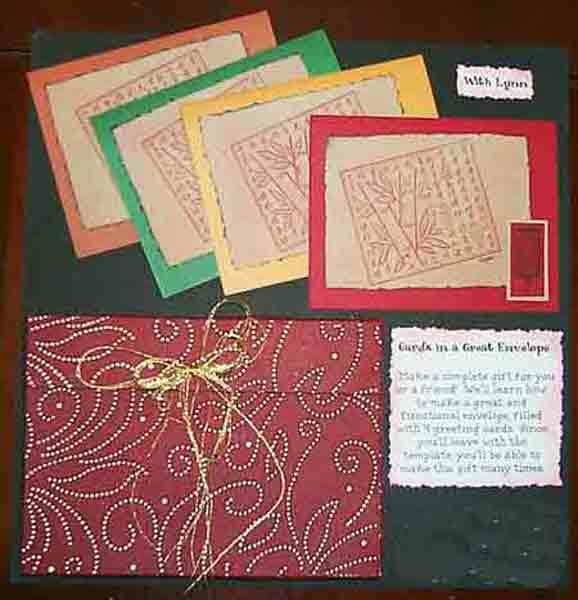 What a great technique to use either on a scrapbook layout or a card! 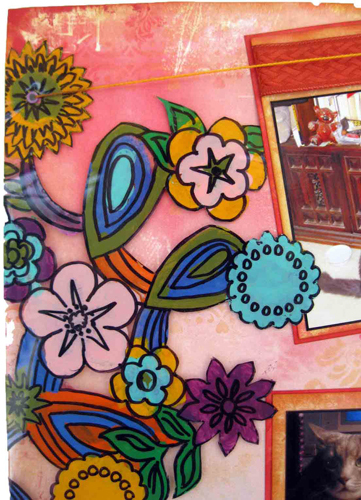 Using acetate and acrylic paints, you'll learn how to make this really cool layout. 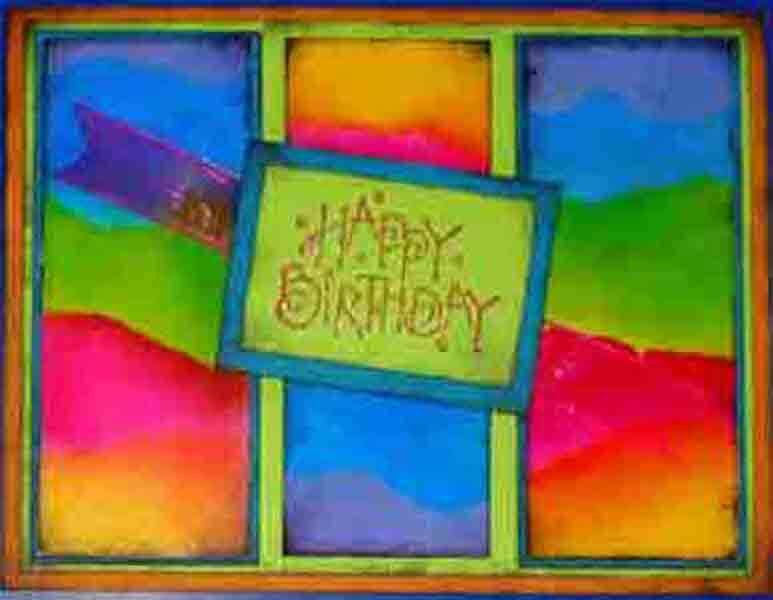 Don't let the colors fool you - your color choice is yours and is only limited to what color acrylic paints you have. 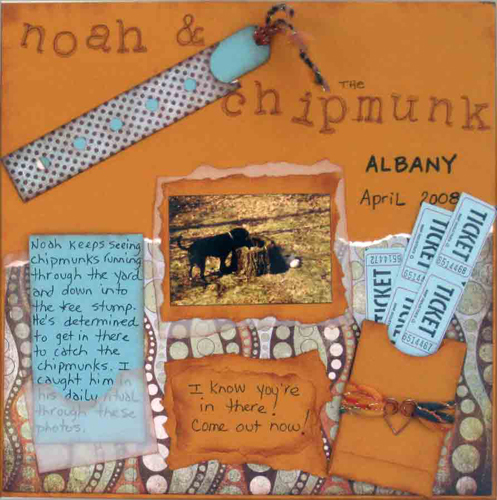 This is an awesome 2-page animal themed layout. It's embossed! It glitters! It jumps out! It's got beads! I promise it will be one of the cutest and most enjoyable layouts you'll ever make! Using the Pinecone Press A-Z Techniques book, we'll learn and play with 5 awesome techniques: Alcohol Inks, Bleaching, Wet Embossing, Embossing on Metal and Notions. This is so much fun, you're guaranteed to have a great time and learn a lot! 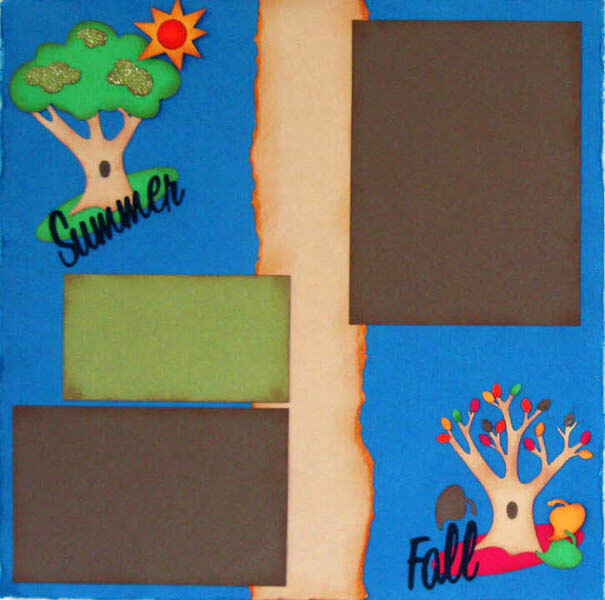 An Autumn themed Flap Book. 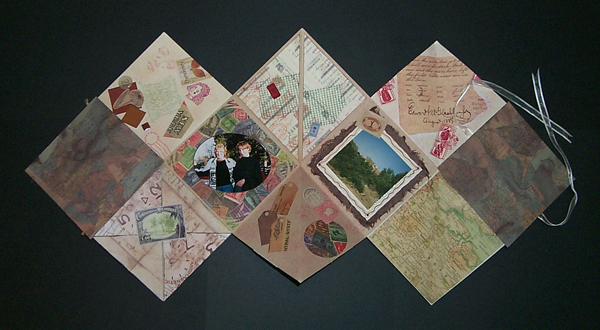 The papers are gorgeous and the project is easy. 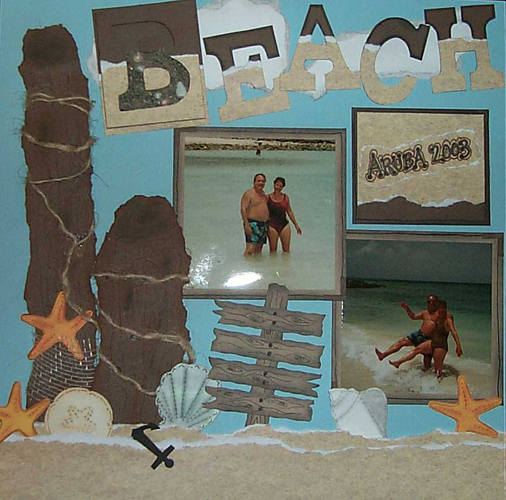 A beautiful way to showcase holiday pictures or make it for one of your guests for a great memoir. 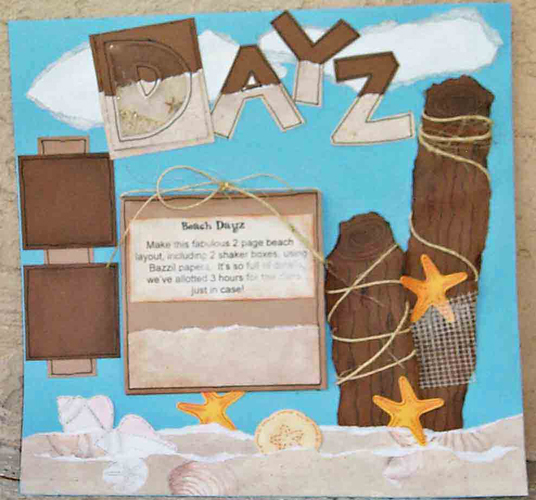 Make a fabulous 2 page beach layout, including 2 shaker boxes and two-toned letters, using Bazzill papers. It's so full of details and fun, You'll need to allow extra time to finish it! Make sure you have lots of adhesive. 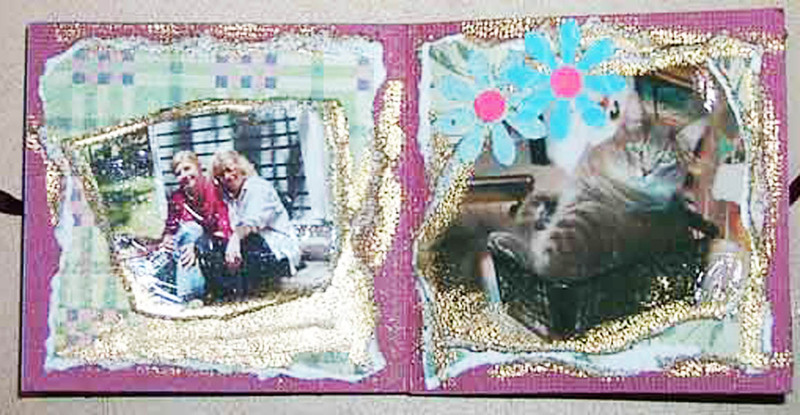 Bind and make a mini-album to showcase small photos. Discover all new uses for common household bleach. 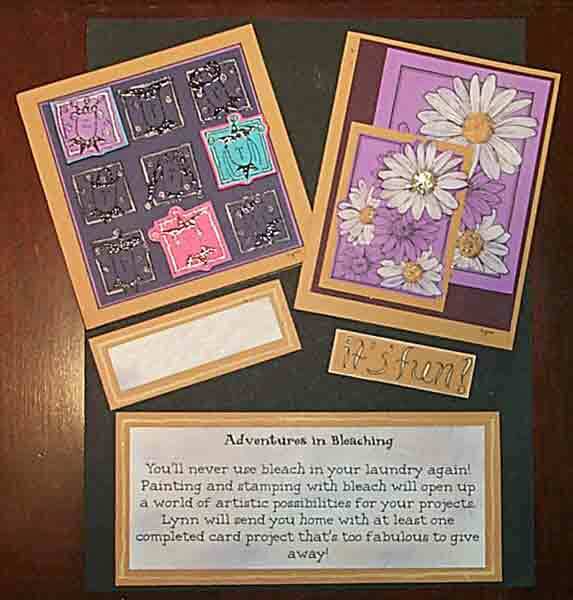 Painting and stamping with bleach will open a world of artistic possibilities for your art. 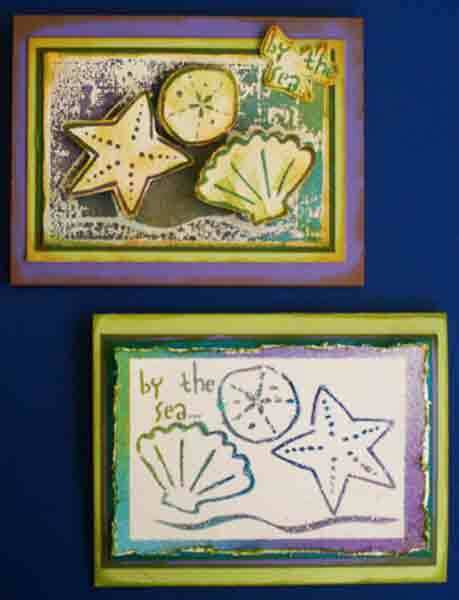 We'll experiment with different kinds of paper, tools, powdered pigments, embossing powders and inks. You'll leave carrying at least two completed cards—but we can't promise you'll want to give them away. 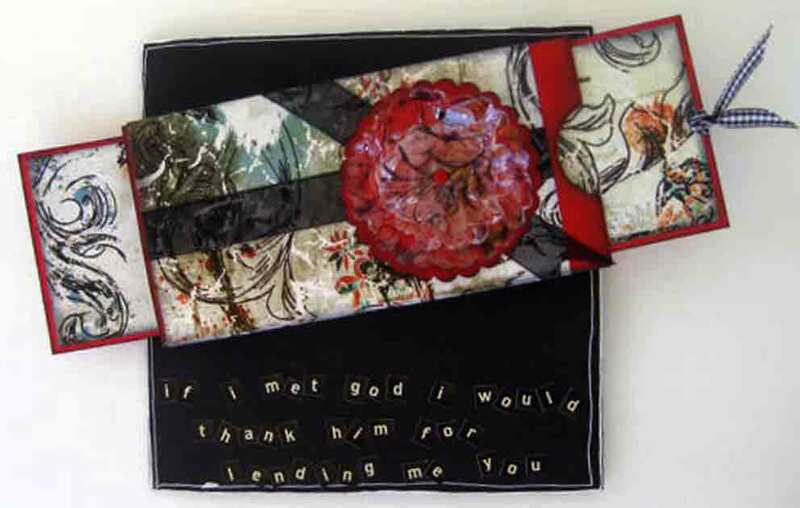 Make a complete gift for you or a friend! 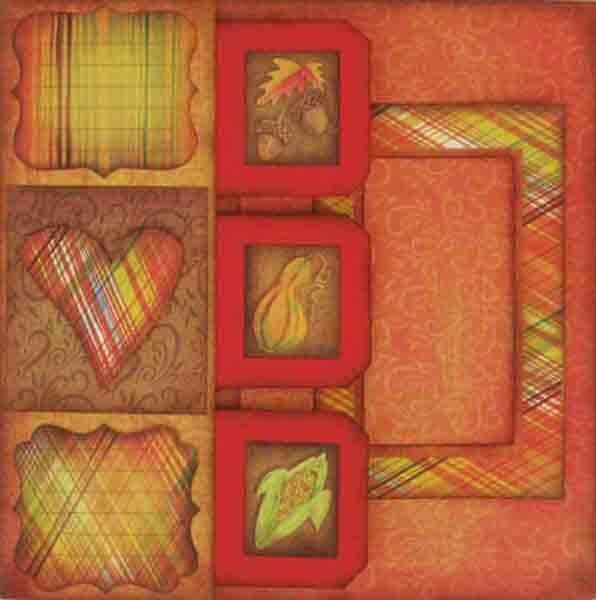 Using some awesome specialty papers, we'll learn how to make a lovely and functional card box, filled with 4 matching, themed cards. 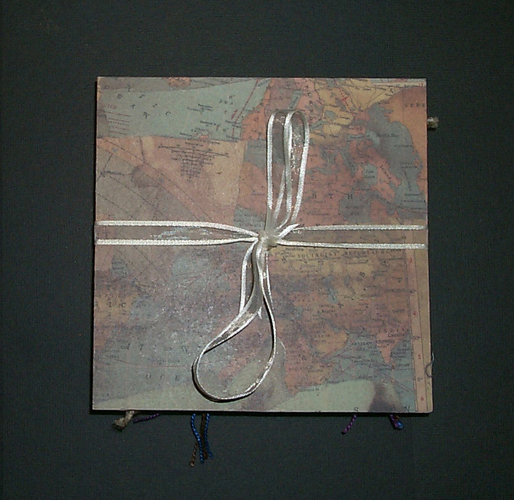 Since you'll leave with the box template, you'll be able to make this gift many times. It's a complete package! 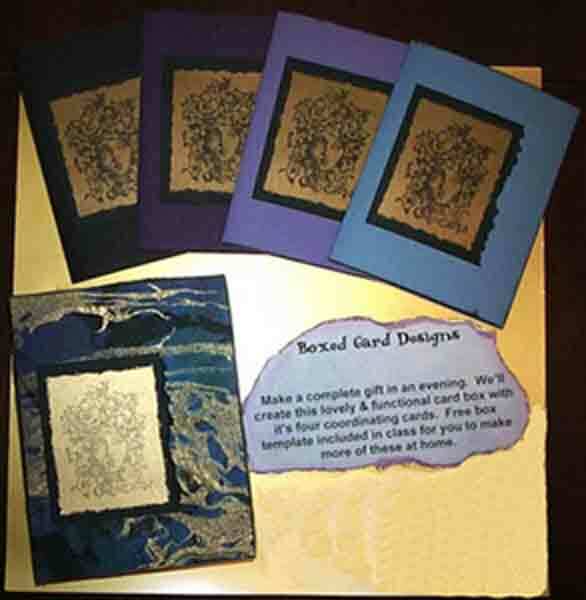 We'll make a beautiful card portfolio along with 4 matching greeting cards. The portfolio template can be used to create this gift over and over. 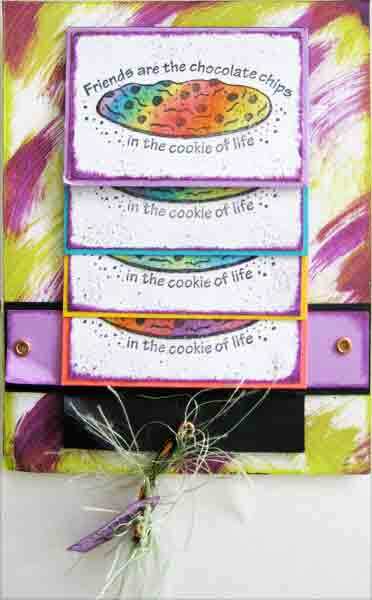 Make your own artistic pages and greeting cards using beautiful and forgiving chalks. 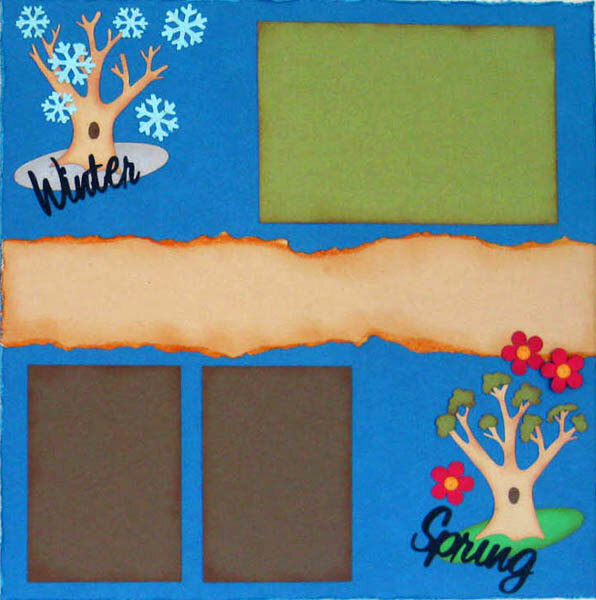 We'll use chalks to make colorful die cuts, 2 background scrapbook pages, and tag and card designs that will stand out from the crowd. 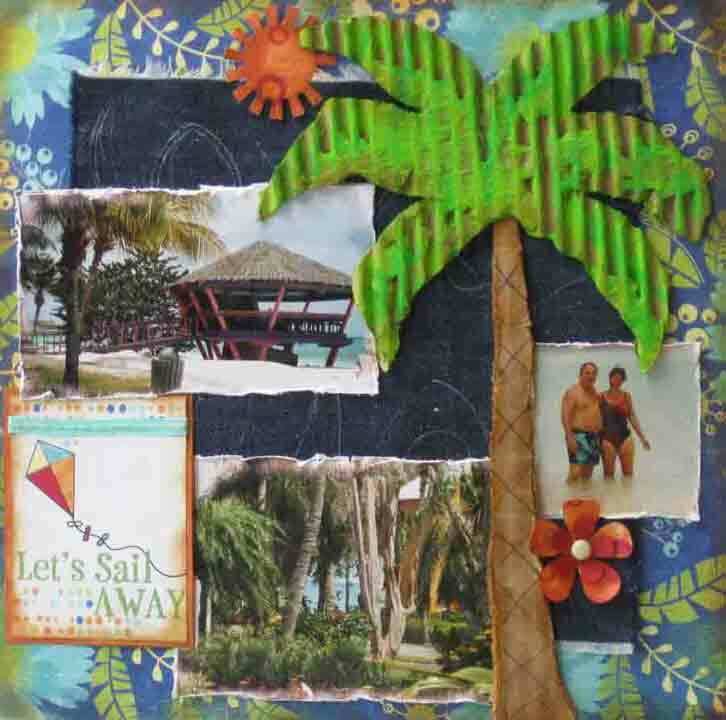 Using your creative juices, make a travel themed 2-page layout using an interesting collage technique. 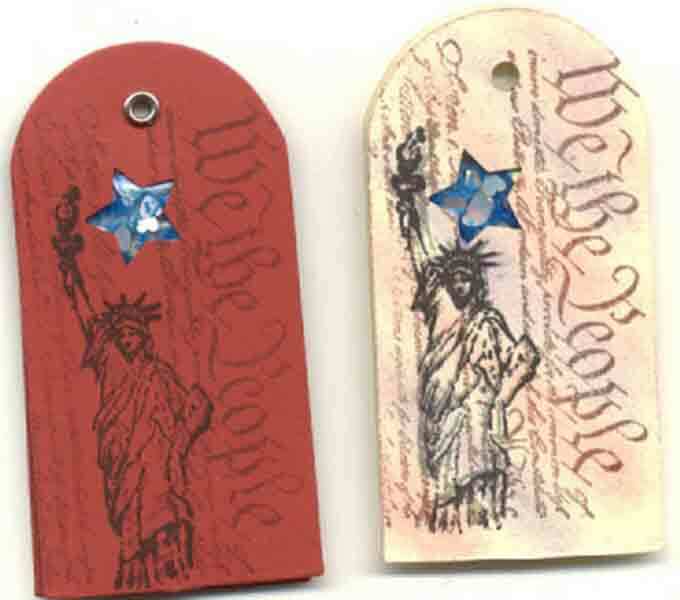 Some of the materials included are stickers, travel memorabilia and related papers. 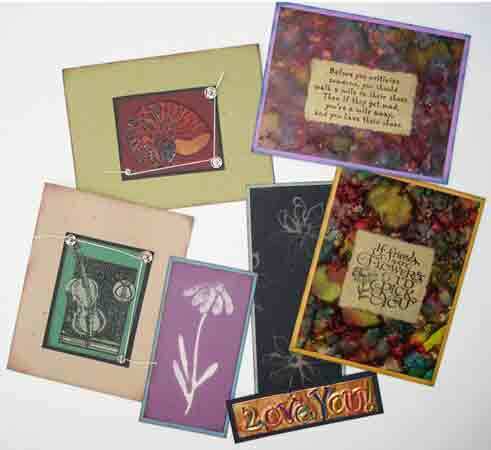 These truly are gorgeous cards whose true beauty is hidden in these pictures! 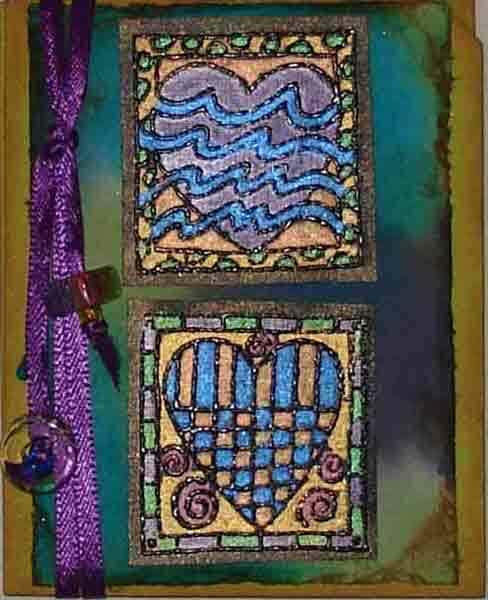 Using Stazon inks, interesting rubber stamps and glossy cardstock, we'll make 2 gorgeous cards and learn a technique you'll never stop loving. 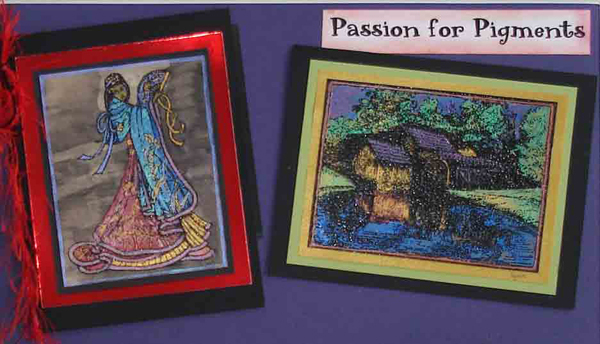 These are two of the latest and most popular card designs. Both templates are in the kit along with all the supplies to make both cards, including hand cut grungeboard gears. 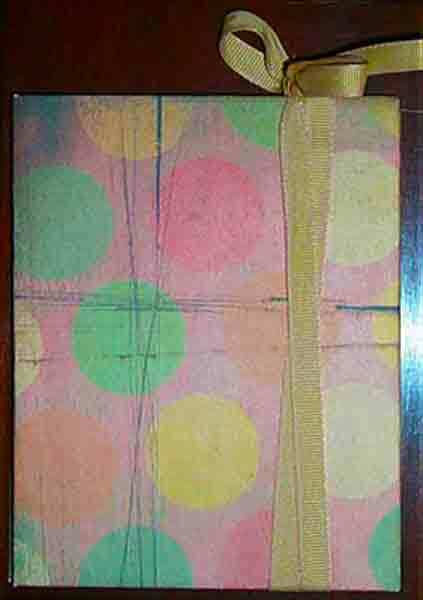 Patterned papers may vary. 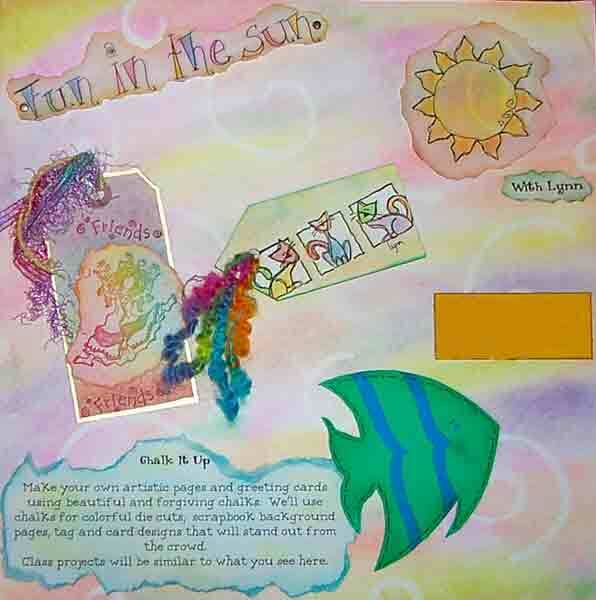 What a fun scrapbook layout! Use corrugated board and denim in a whole new way! 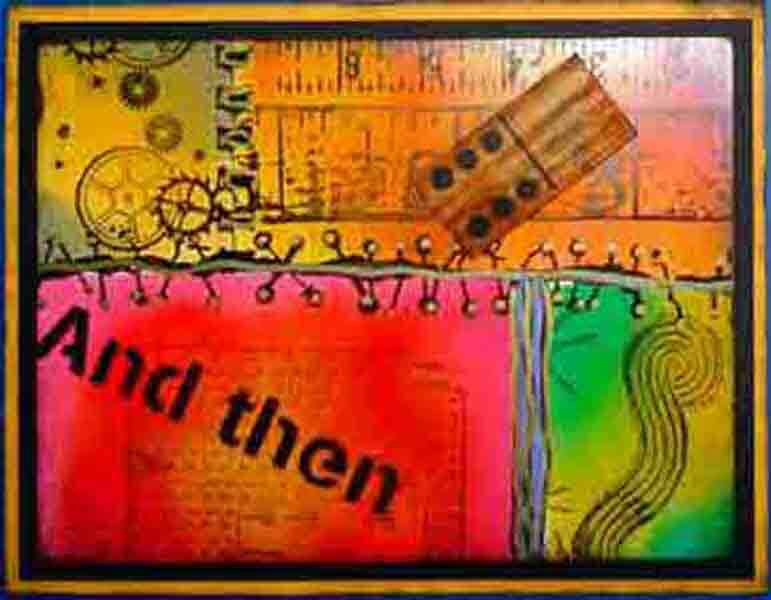 A little acrylic paint, ink and some distressing tools (check out your home tool box) and you're on your way to free expression! Come participate in a fun project! 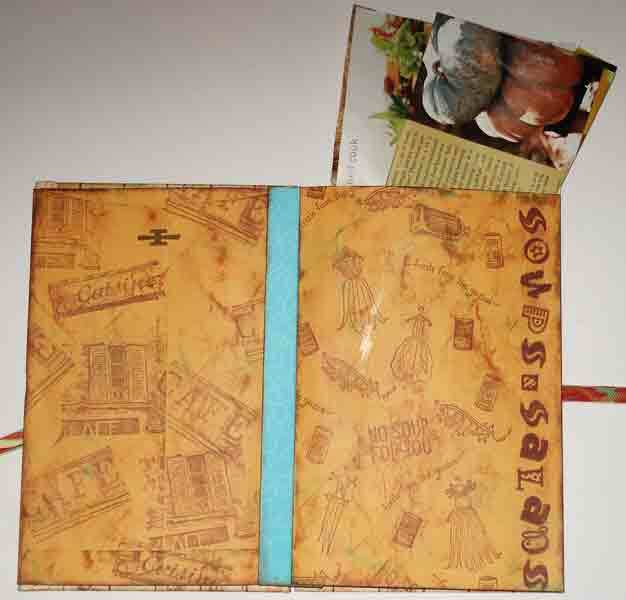 It's an envelope book which includes 15 hand made recipe cards. 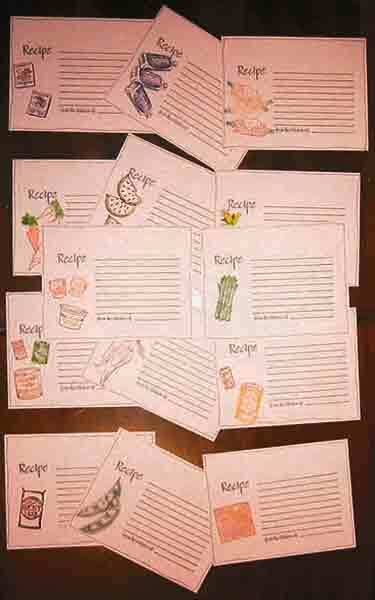 Using the many food-related rubber stamps in my collection and markers, we'll stamp and decorate the recipe cards. 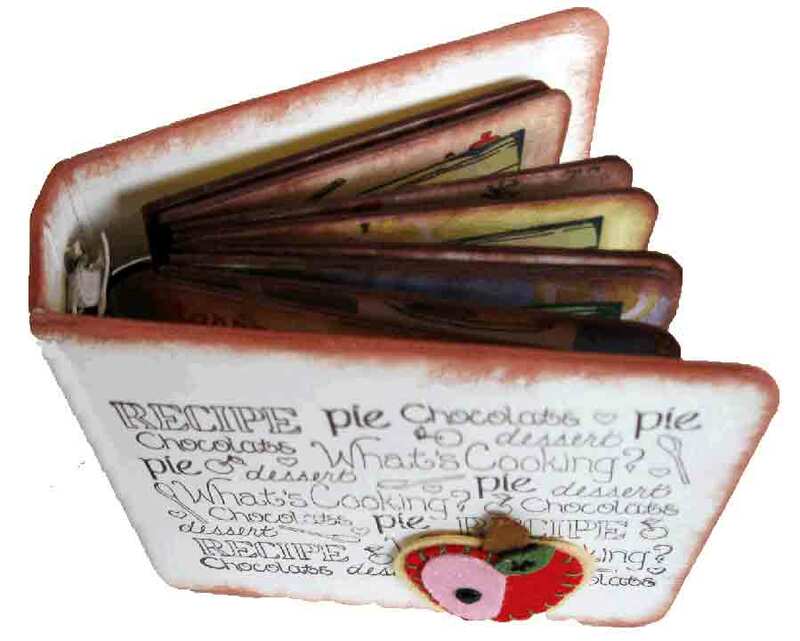 All you'll need to do later is fill them in with recipes and give the book as a fabulous gift. This project is my personal favorite. This box is about 4"x4" and when you remove the top, it "explodes" open. 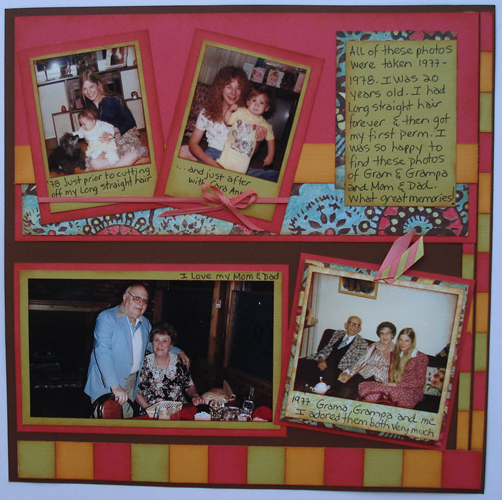 You can add photos, memorabilia, journaling–you can even put a small gift in the box! It's got 8 pockets filled with tags and ribbons and the kit includes all the supplies needed to complete the project (including a roll of red line tape... oh! That was a surprise!). 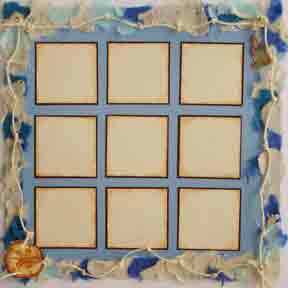 All you need is ink which will add character to the completed project. This has been one of the most popular classes! 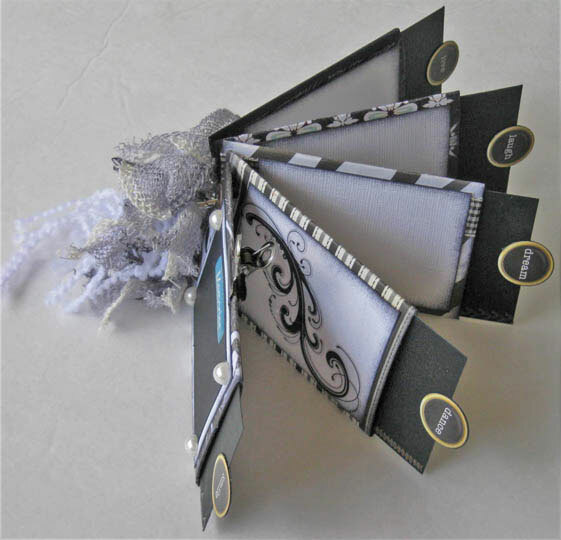 Celebrate life's special moments by creating an awesome handmade book that you'll fill with photos and memorabilia. 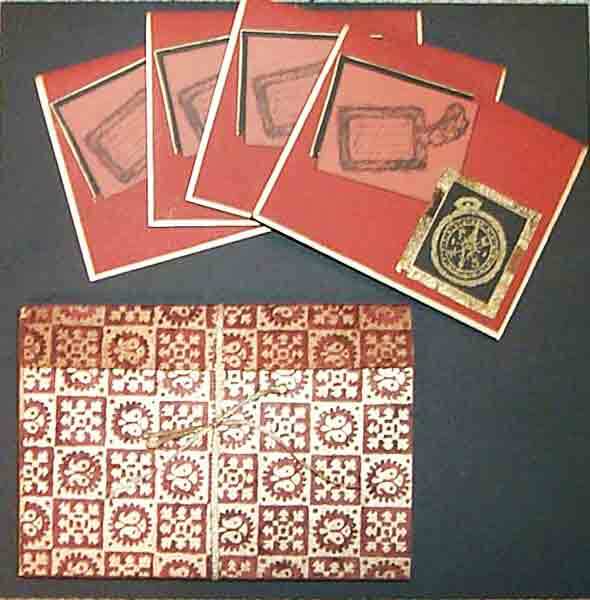 The kit includes papers and misc. 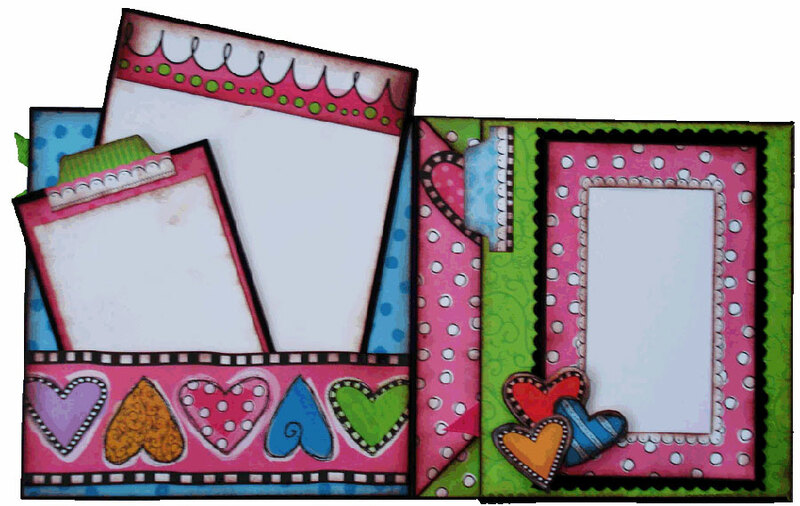 die-cuts and embellishments to help get you started. Once you learn the technique, you can make it in any size you'd like. 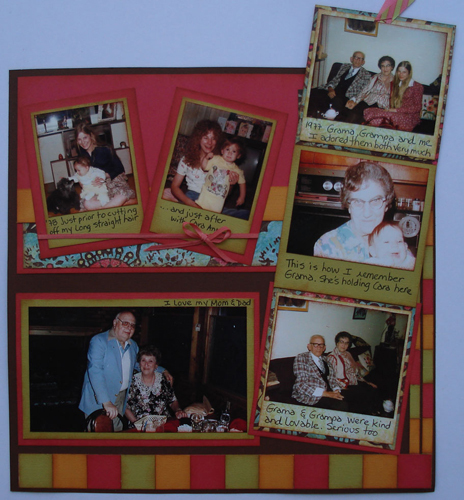 It's a fun and exciting project and makes a great gift for you or someone special. Includes a free instructional video. 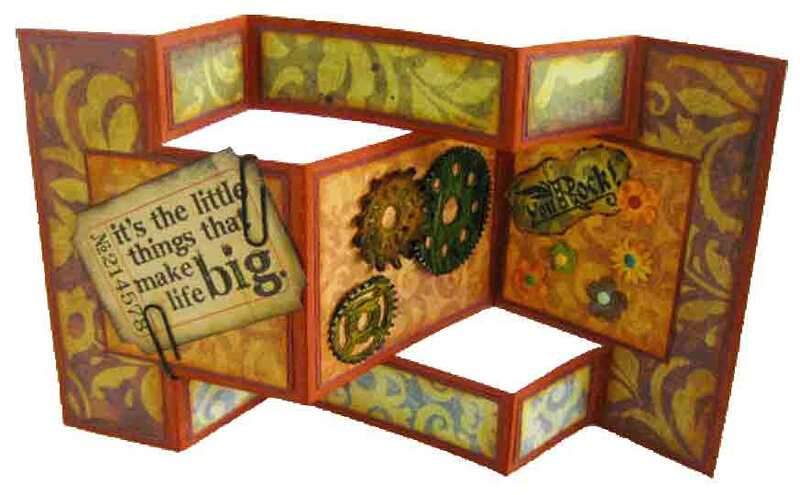 Flap Book that includes a cool new lace frame technique, chipboard frame, grungeboard title, canvas and a really great slider card on the top. The kit also includes a full set of alpha minis by Cosmo Cricket. 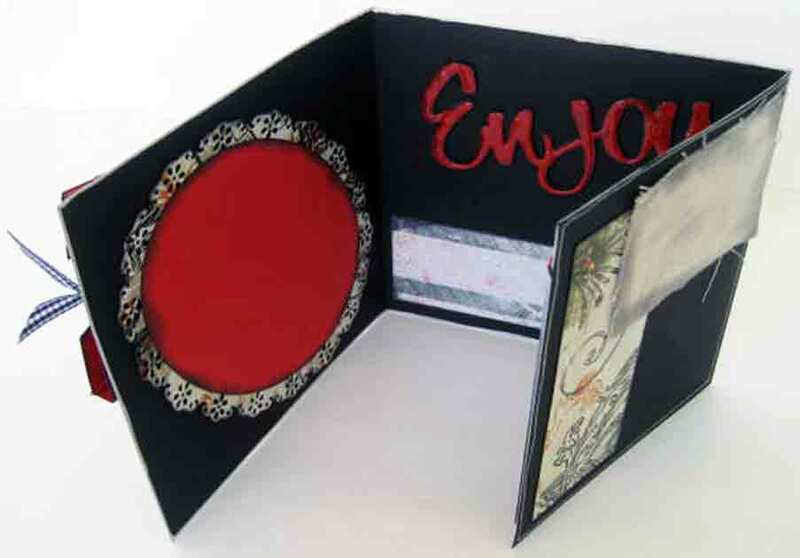 Learn the tips and tricks for working with luscious handmade papers and cardstock as we create a gorgeous stationary set of 4 cards and matching portfolio. 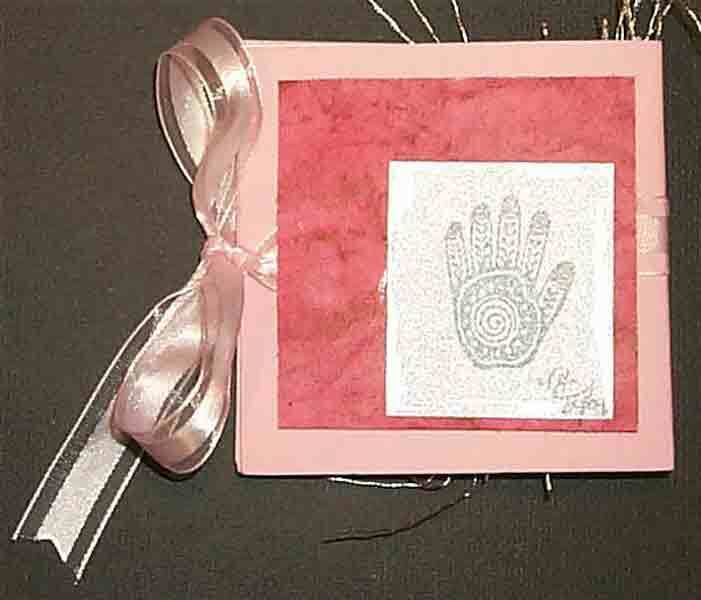 Since you'll leave with the template, you'll be able to make this gift many times. Card making has never been so fun as with this great marker technique. 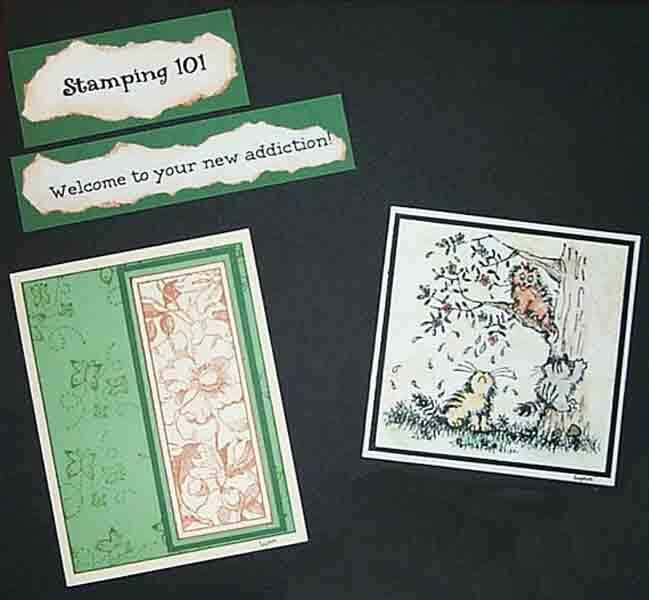 Join Lynn as we discover great uses for your bold stamps. 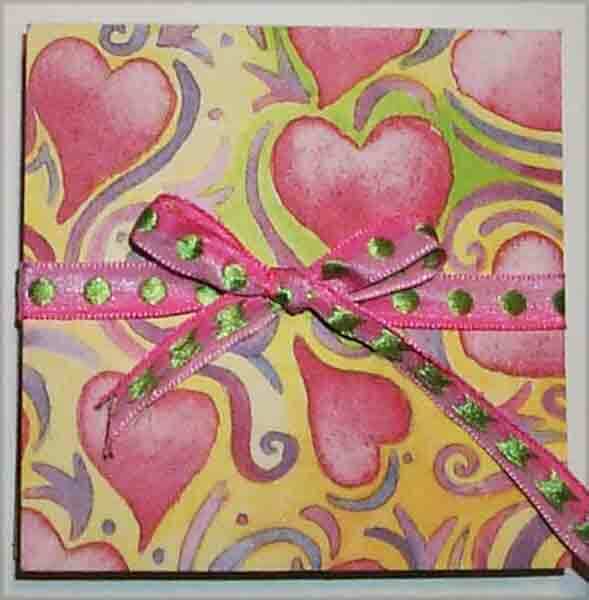 Learn the secrets of stamping with markers as we create a heartfelt greeting card with a coordinating envelope. 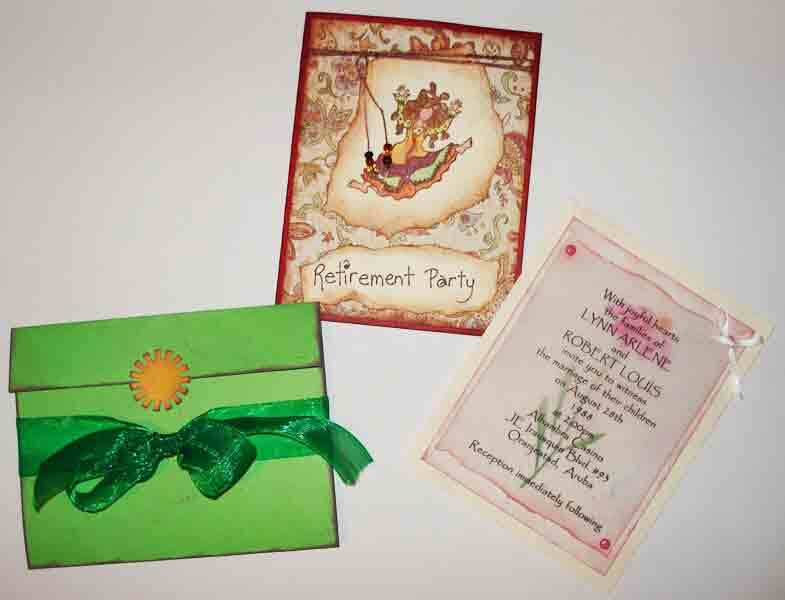 Using different types of papers, we'll make 3 different (invitation) type cards, introducing innovative ideas for invitations. This is a really cool technique and we'll make a great card box with a functional lid. The box template can be reused. 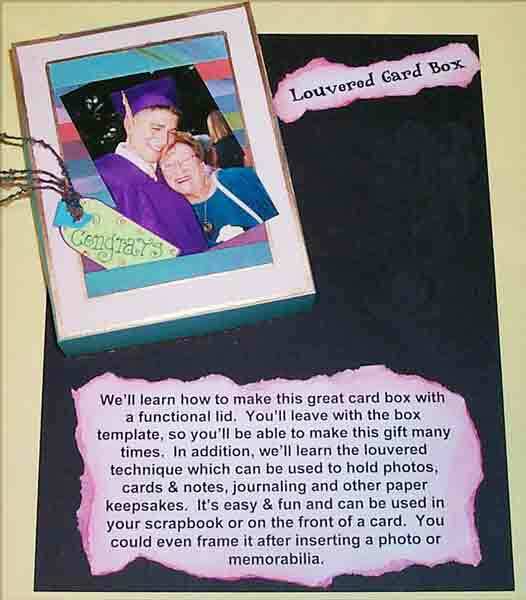 In addition, we'll learn the louvered technique which can be used to hold photos, cards, notes, journaling and other paper keepsakes. 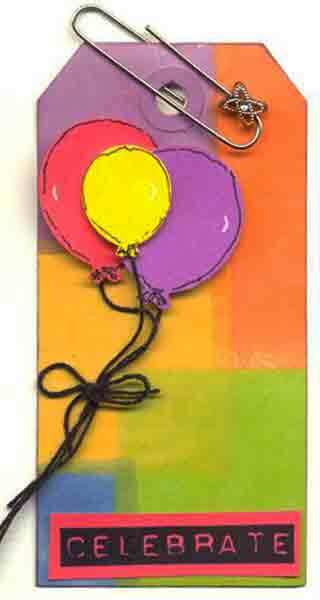 It's easy, fun and can be used in your scrapbook or on the front of a card. You could even frame it after inserting a photo or memorabilia. Be different! 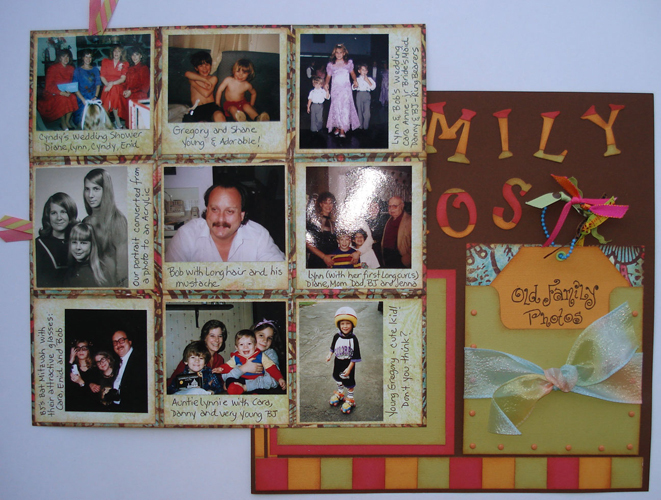 Your scrapbook pages and greeting cards will be the talk of the town! 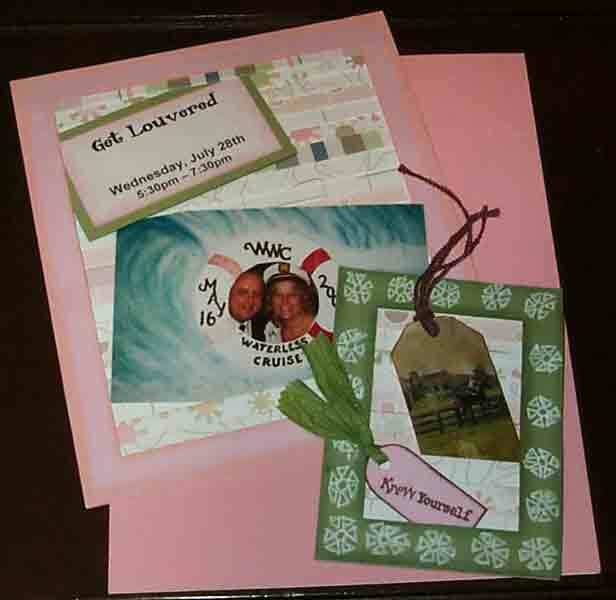 Lynn will teach you this easy process of making louvered windows, to hold photos, cards & notes, journaling and other paper keepsakes. 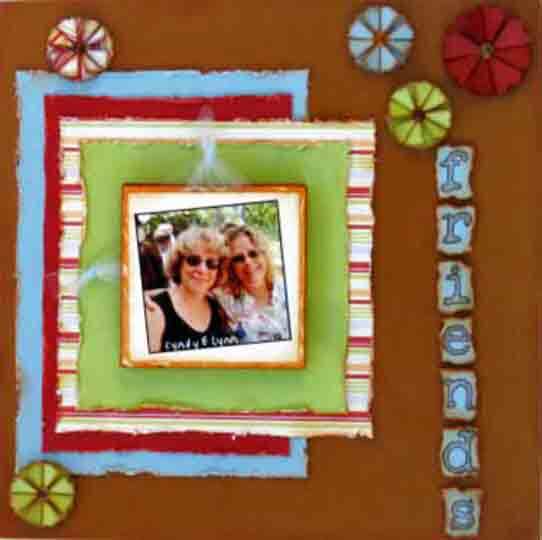 Participants will leave with a scrapbook page and a completed greeting card. 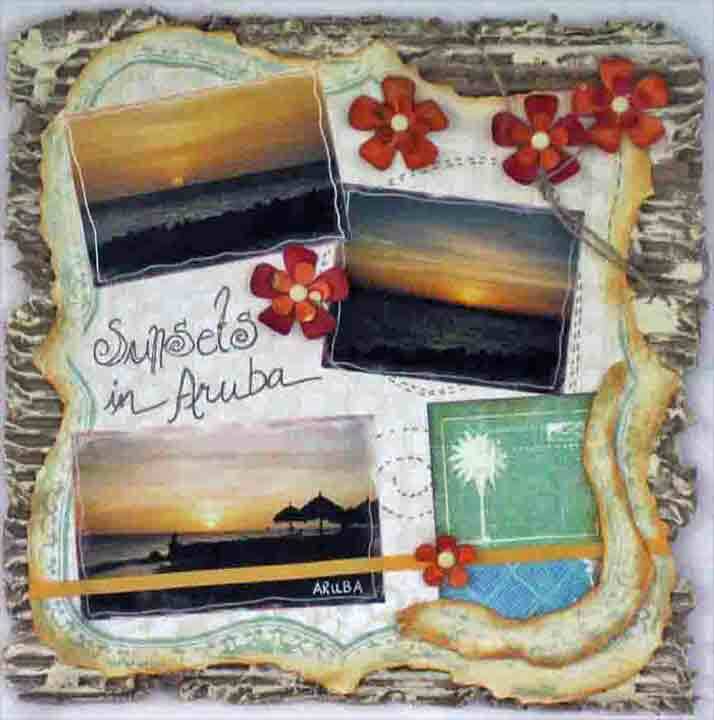 Learn how to create artistic variations on photos by tinting, coloring, veiling, stamping, cropping, and collage for all those duplicate photos lying around. 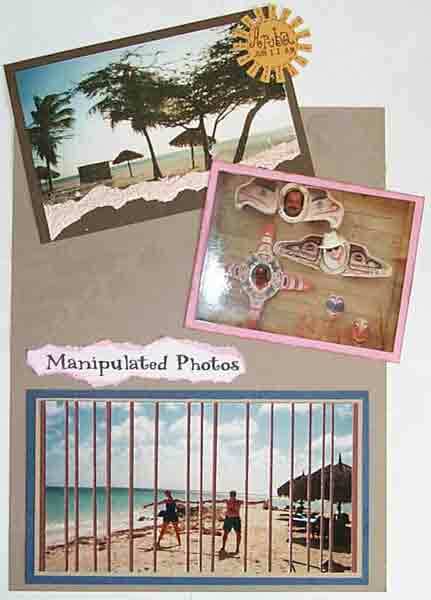 Playing with photographs will show you a whole new dimension in your art form of choice from collage and altered books to scrapbooks and greeting cards. Please bring 8-12 photos you want to alter. Try something new! This is a fun little project! 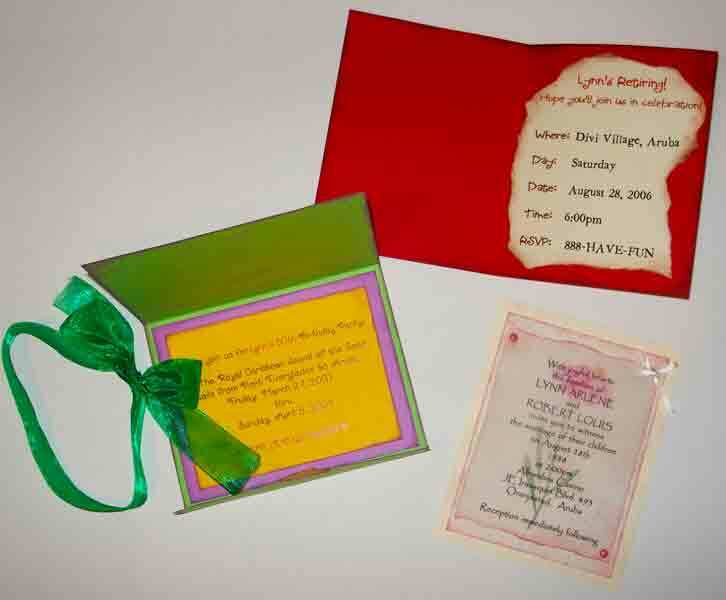 Using pigment powders, acrylic paints, fibers and beads, you'll embellish a slide mailer. 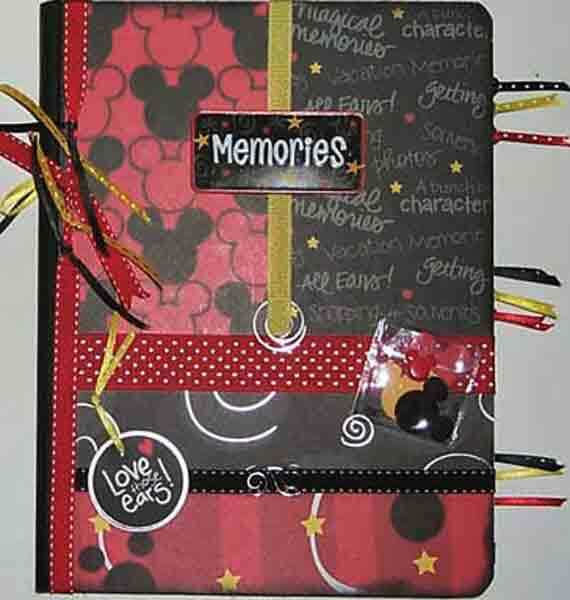 We'll start with a simple composition book and "alter" its cover and back, inside and out using papers, ribbons, stickers and Mickey related embellishments. It's just plain fun! 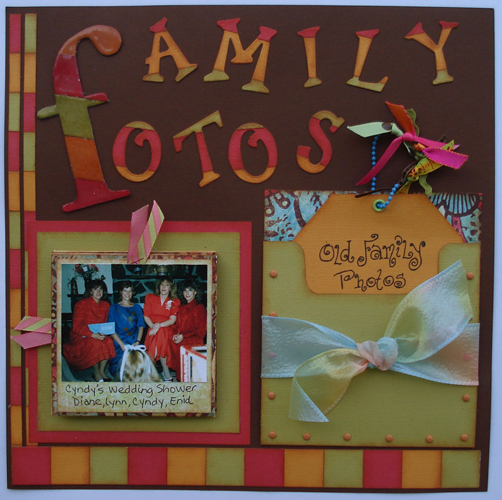 Make an easy and fun album out of this K & Co. tag album. It is so cute and fun! 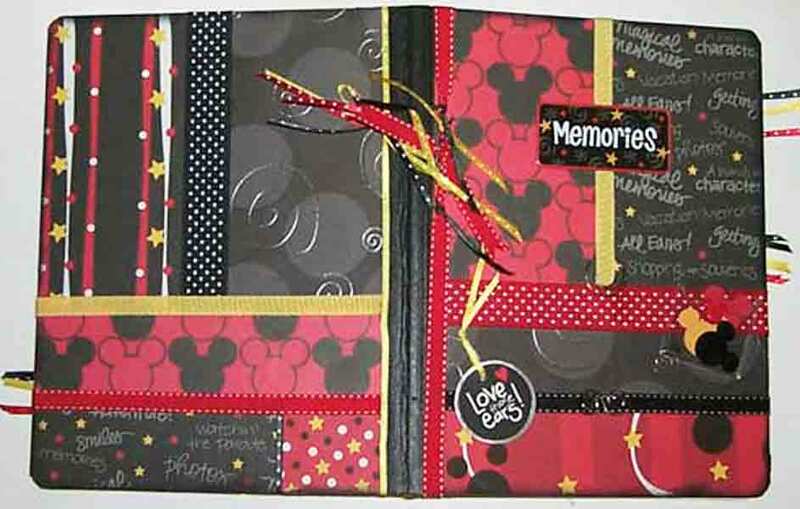 This is an adorable 3-page Mickey Mouse flap book album with many flaps and pockets for photos, journaling and memorabilia. 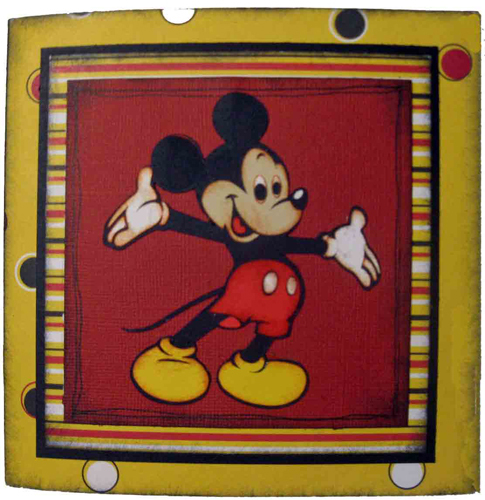 Also included in the kit is a Mickey Mouse paper piecing kit to make the Mickey Mouse on the cover. 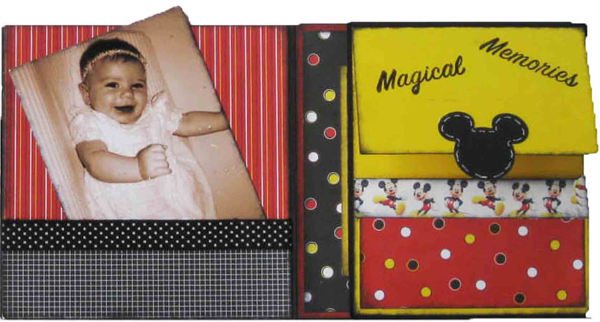 This 2-page Mickey Mouse layout includes a Mickey shaker box and cool, hidden, journal block. 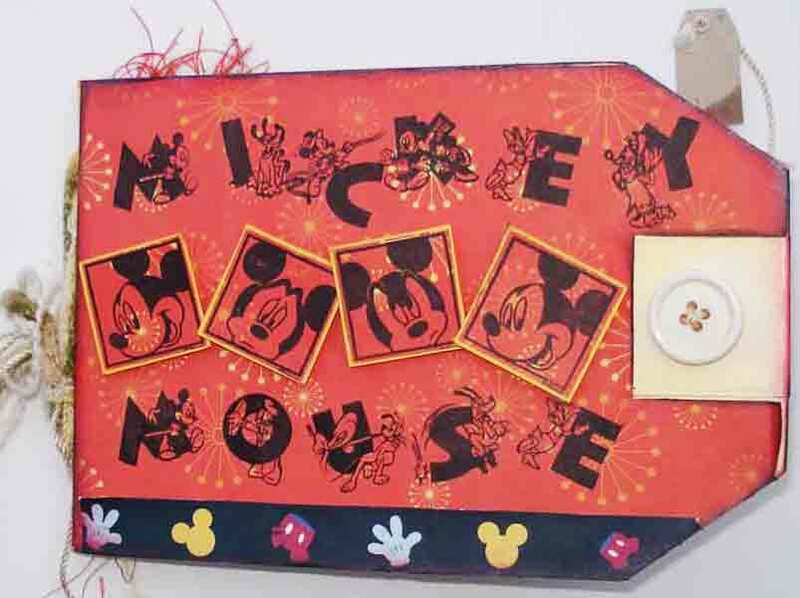 We'll use Mickey themed acetate, vellum, bottle caps, stickers and fibers to decorate the 2 pages. 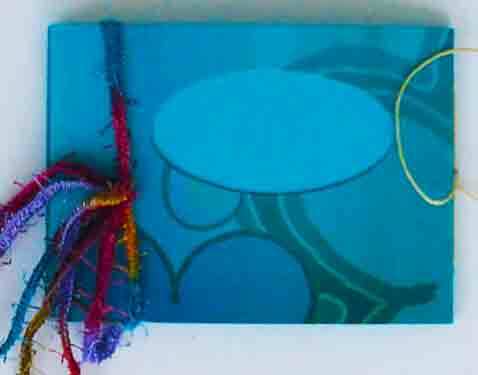 Miniature Gift Cards for every occasion. These are truly adorable! 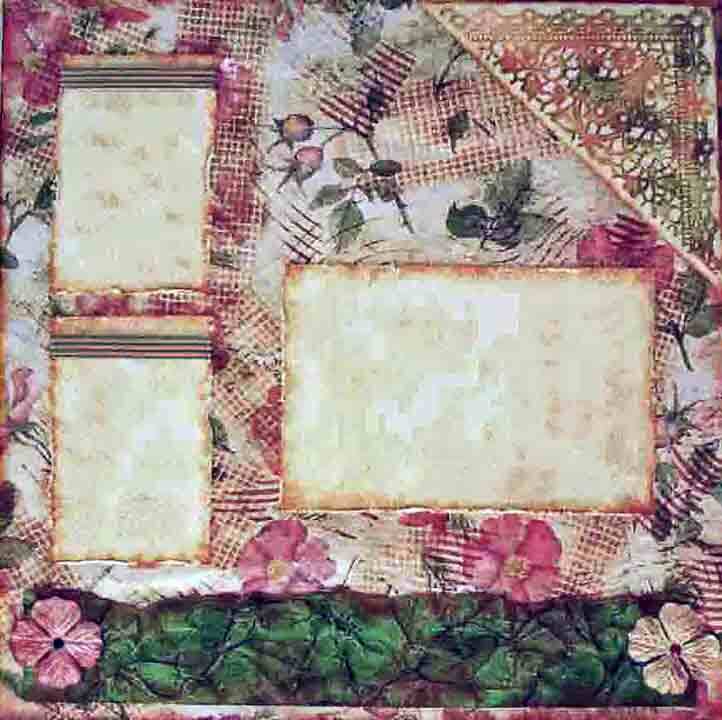 You'll get all the supplies to complete 12 cards: cardstock, a sheet of icons for the card fronts and all the fibers and embellishments you'll need to make each card unique. You will definitely have fun with this! Create a beautiful book that opens into a star display. 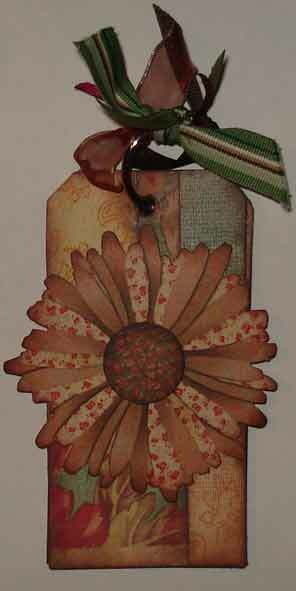 It stands only 3" high and is completely decorated in the workshop with rubber stamps and handmade papers. There are two different themes you can pick from: either a "Face it - Your great" book, or a book full of photos and tags. 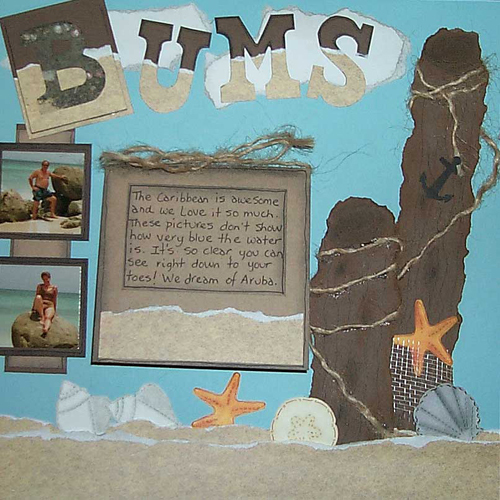 You'll be feeling great as you complete this fun project for yourself or for someone special. 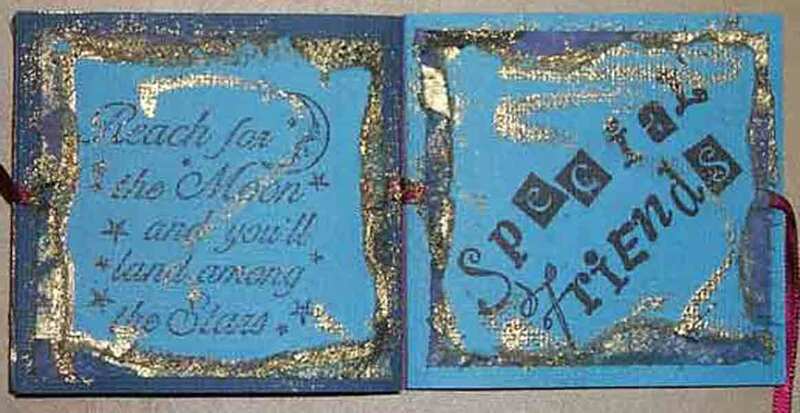 We'll make 3 great cards using Memories Mist, Perfect Pearls pigment powders, gorgeous papers and a creative use of stencils. 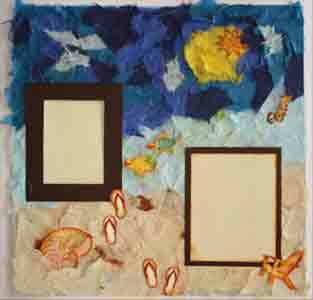 Every month, we have 2 Paper Playground clubs – one is in Wellington and the other is in Boynton Beach. 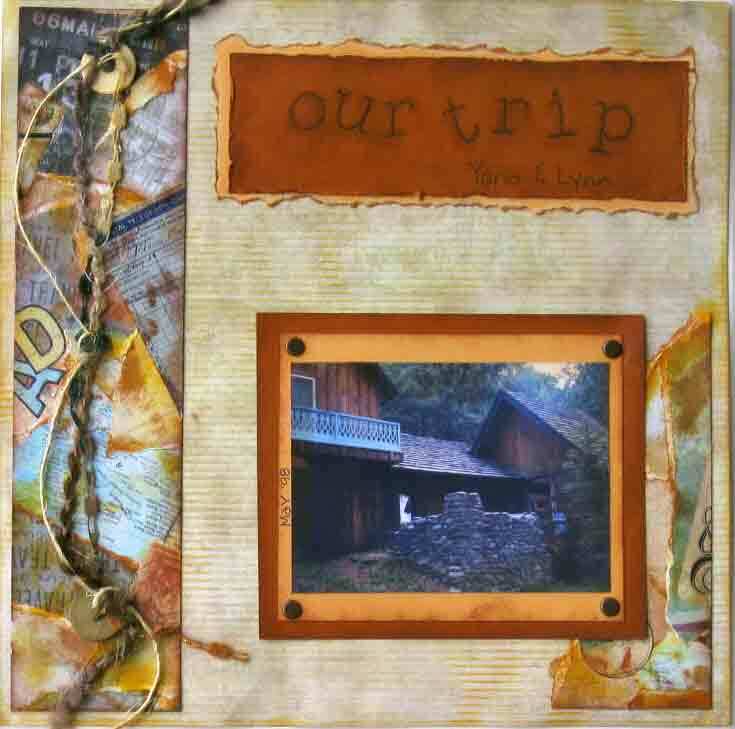 It's a chance to get away from home with a group of like minded crafters. We relax, chat, play, have the chance to practice our artistic expression, snack and always enjoy ourselves. 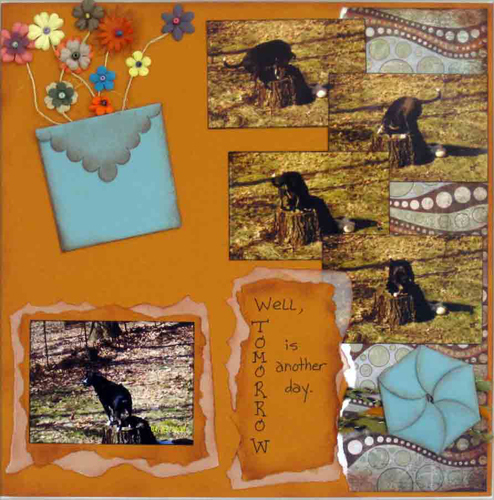 You will always leave with a completed project, be it a scrapbook layout, a paper project or cards made using a cool technique. Awesome! Gorgeous! 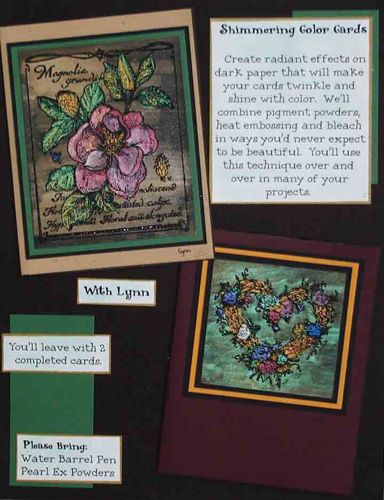 Create radiant effects on dark paper that will make your cards twinkle and shine with color. 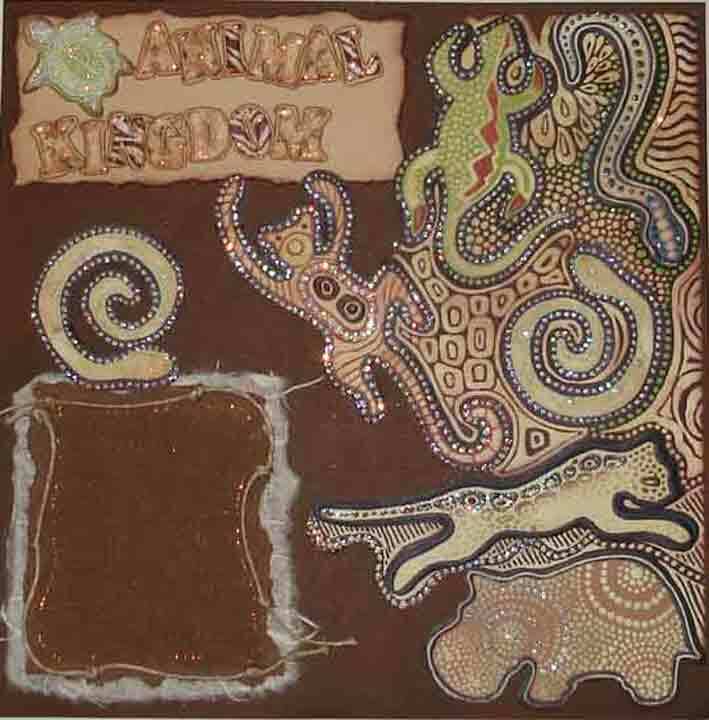 It's all about pigment powders, heat embossing and bleach. You'll make 2 beautiful cards. Using black & white calendar paper and library pocket cards, we'll make this perpetual calendar that's makes a practical, crafty gift. Awesome! Gorgeous! 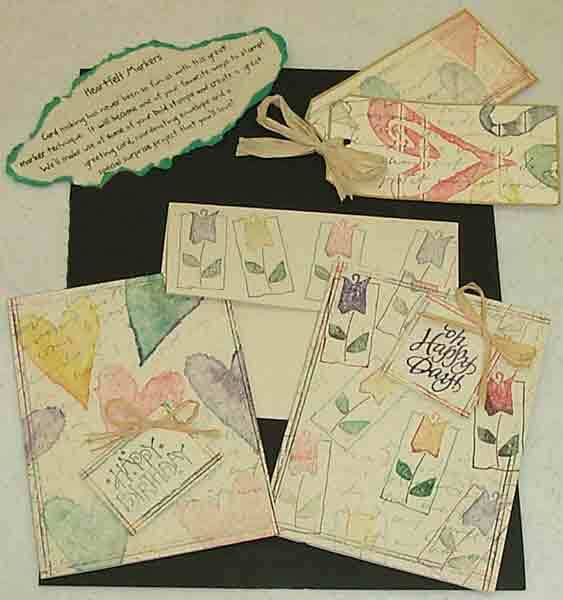 Create radiant effects on dark paper that will make your cards twinkle and shine with An adorable collection of your personal favorites. 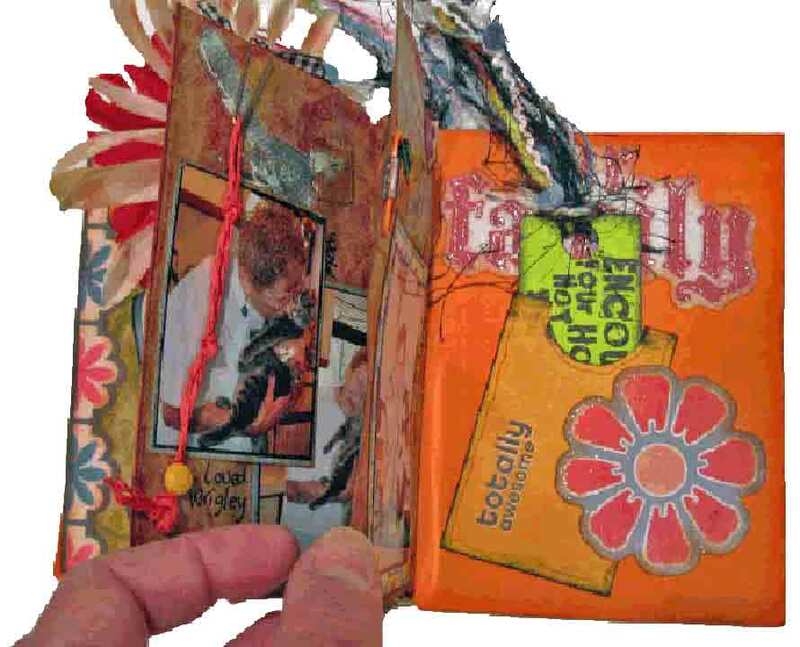 You'll make an accordion book filled with pockets and lots of fun facts - either about you or someone else. This is a very easy, relaxing and fun project. 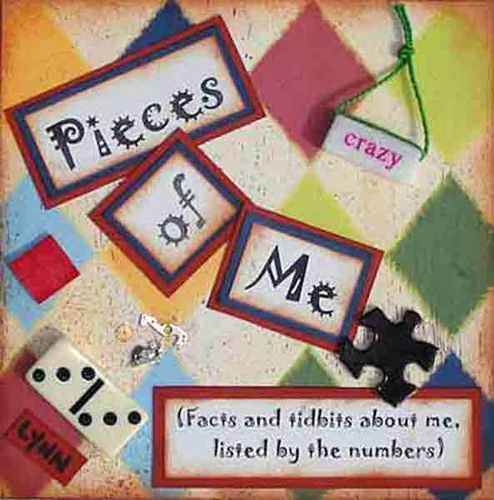 It makes a great gift for to give with facts about you or for someone to provide facts about them. 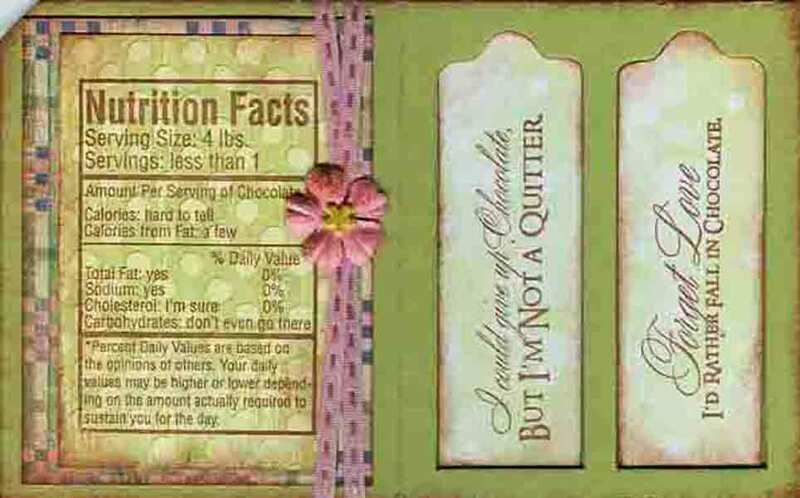 "Quilt" a tag book full of stamped quotes, by using standard shipping tags, inks, fibers, and Daisy D papers. It's a cool project with cool pre-stamped quotes. 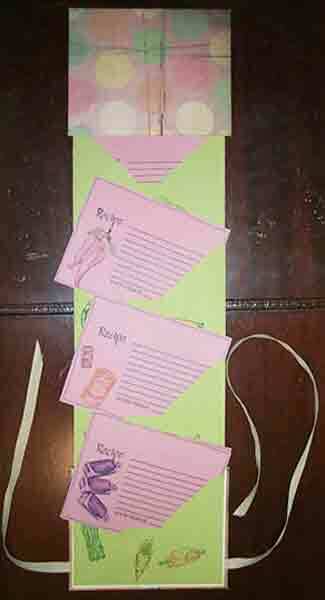 We'll use large manila envelopes and an accordion binding to make a recipe envelope book. 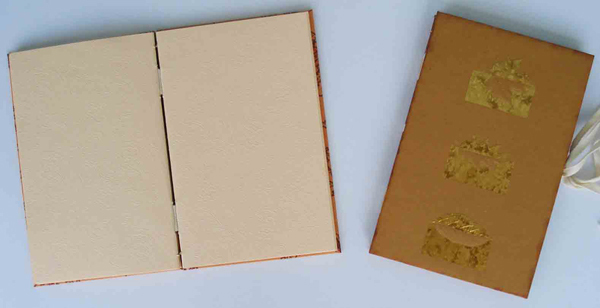 Using a scoring technique and inks, we'll create a wonderfully textured cover and back. 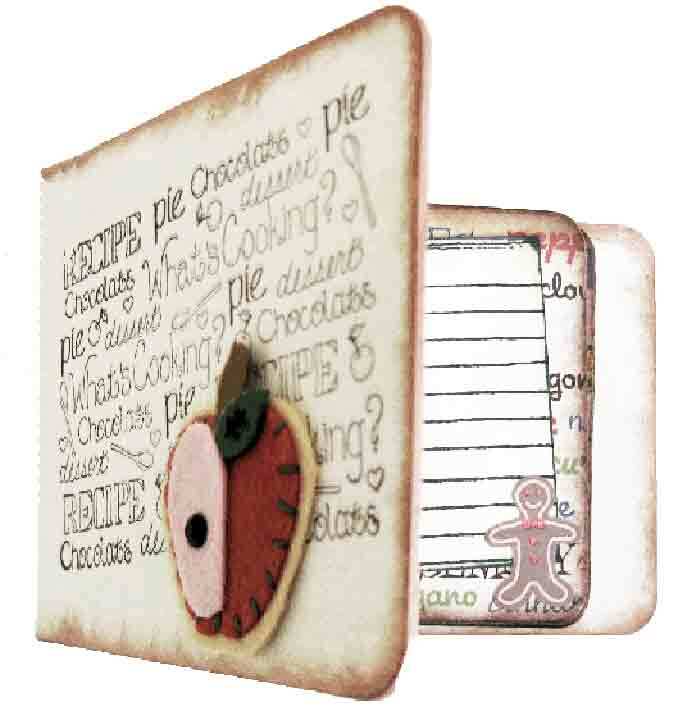 In addition, we'll stamp food items (I have lots of food related rubber stamps) on the envelopes and the book can be used to store all those misc. 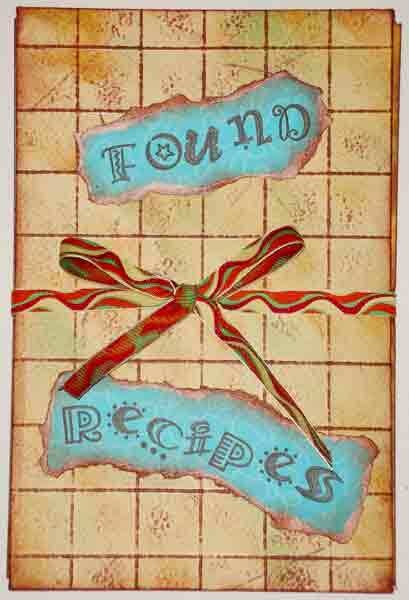 recipes we collect from magazines and other people. This book is adorable and super strong since it's made of thick book board. 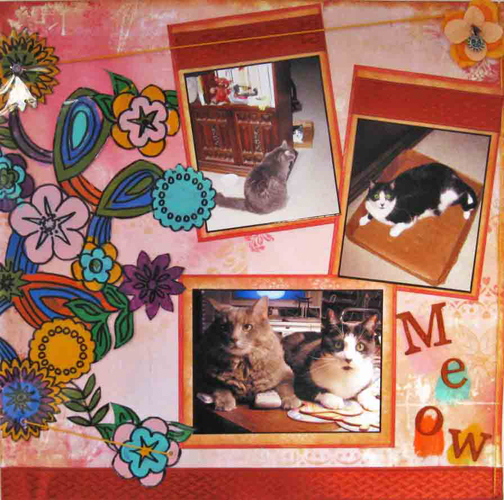 The kit includes a Maya Road 4"x4" binder book, lots of different food related patterned papers, lots of different food related stamped images (pre-stamped for you), and some cool embellishments. All you need is adhesive, acrylic paint and a little ink. 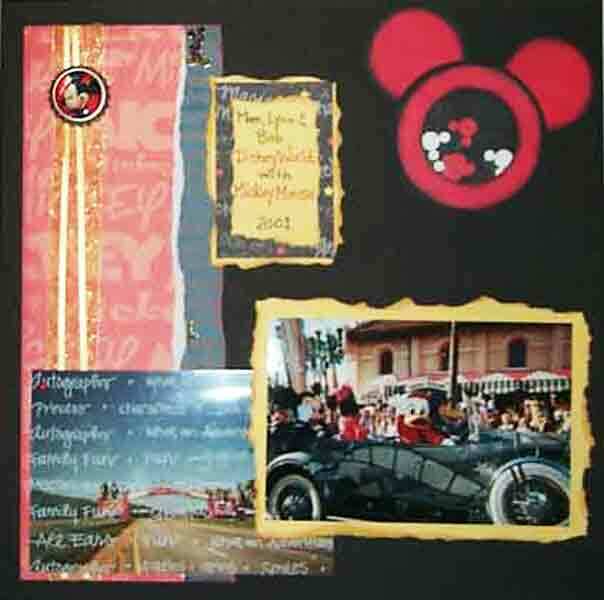 Learn the basics of scrapbooking. 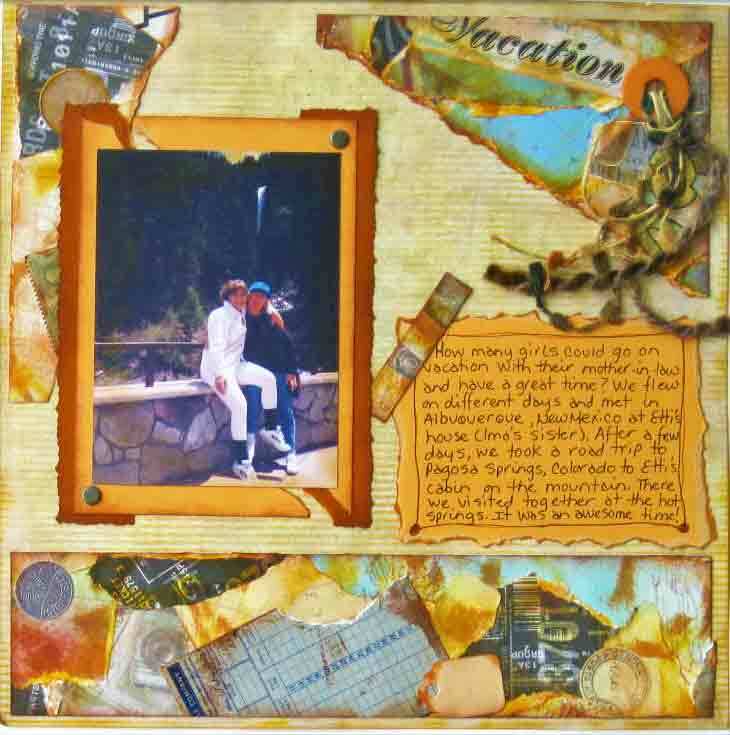 You'll be introduced to the world of scrapbooking and you'll learn how to make beautiful layouts so that your memories will last for years to come. 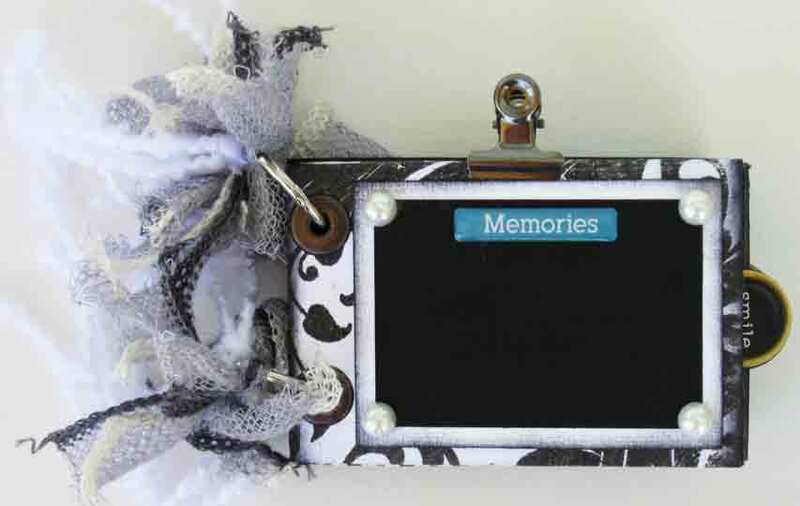 Take your scrapbooking to the next level! 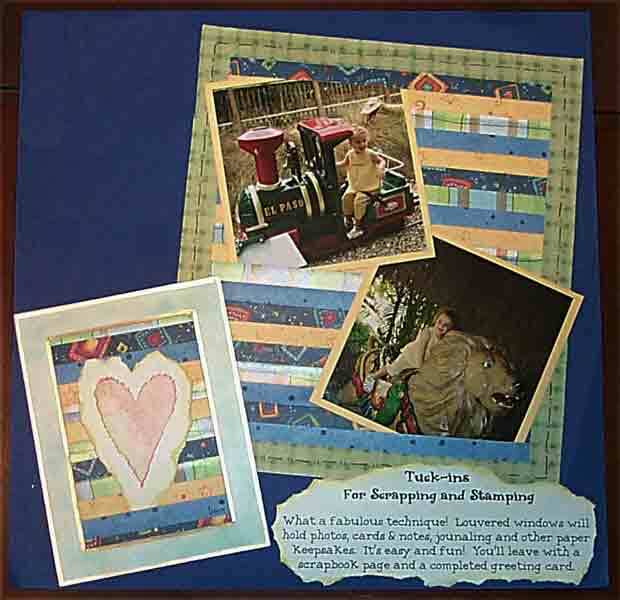 Learn how to use eyelets, brads, chalks, fibers and tearing paper to accent your scrapbook layouts. 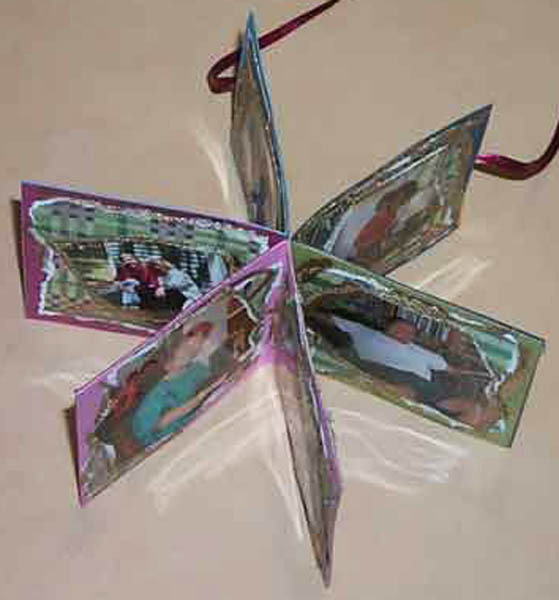 A small (3"x3") version of the Explosion Tribute book. 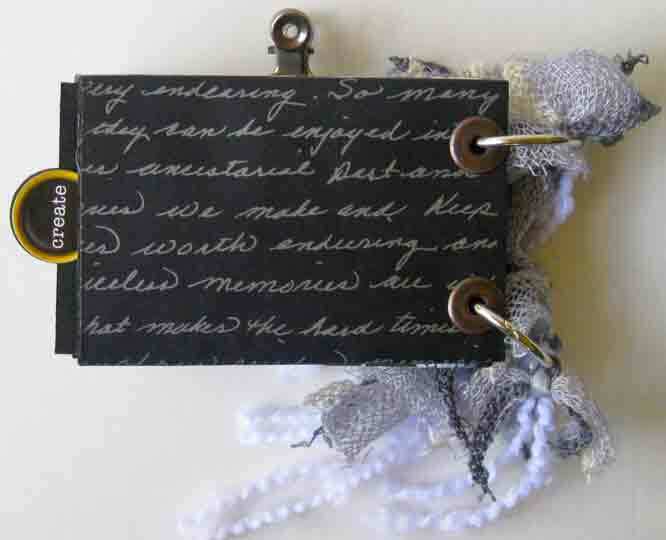 It's a delightful project, small enough to carry with you and makes a really great "brag" gift. A bright and cheerful 12-page Staggered Album where all of the papers are cut and pre-scored for you. 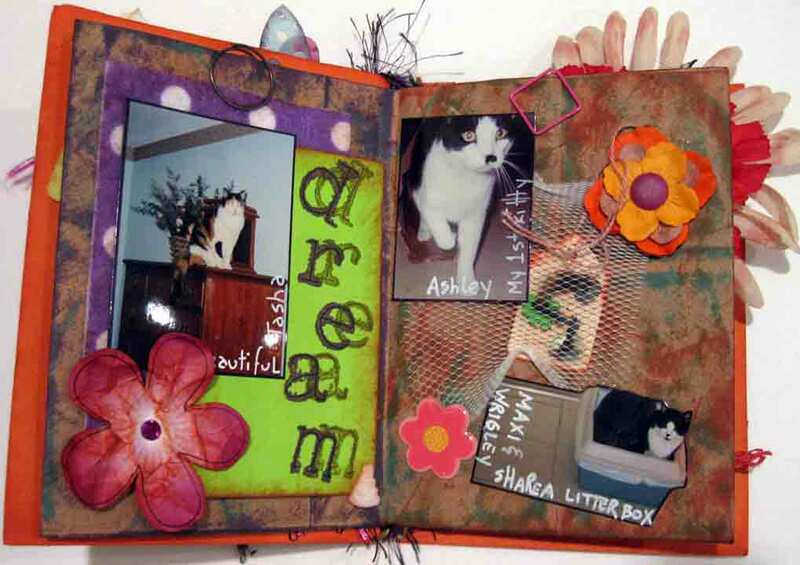 All you need to do is put the book together and add the fibers and embellishments that are included. 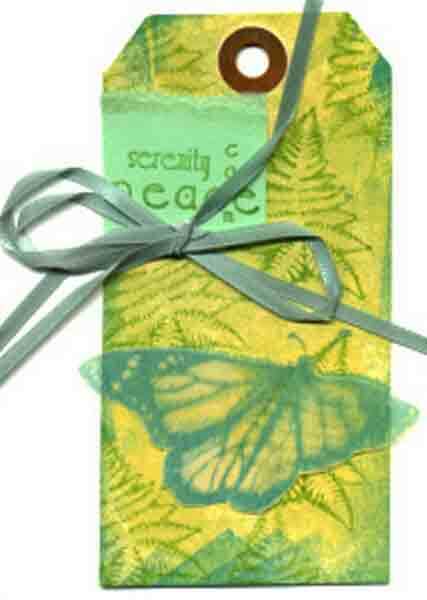 Rubber stamps are the key to personalized greeting cards, gifts and home décor. 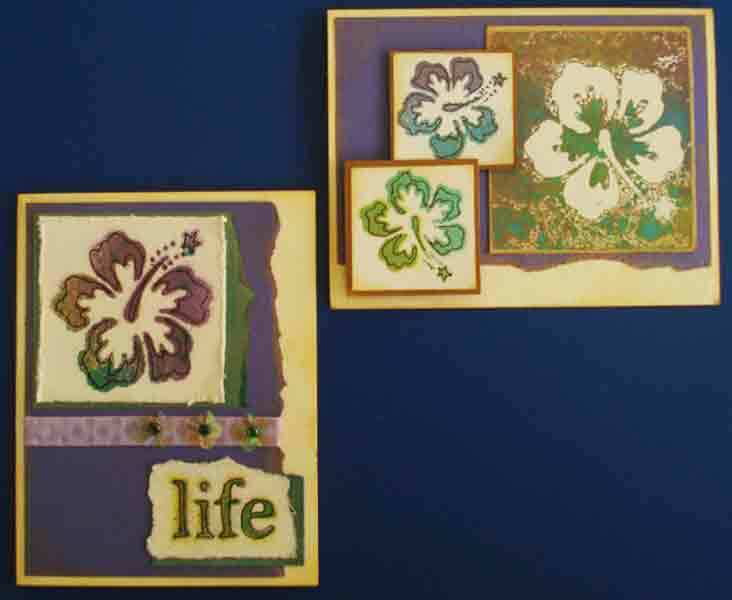 Learn how easy it is to start stamping as Lynn guides you through the use of stamps, inks, markers, chalks, papers and heat embossing. You'll leave with at least 2 completed card projects and a new love. Who would have thought you could make an adorable album from toilet paper rolls? 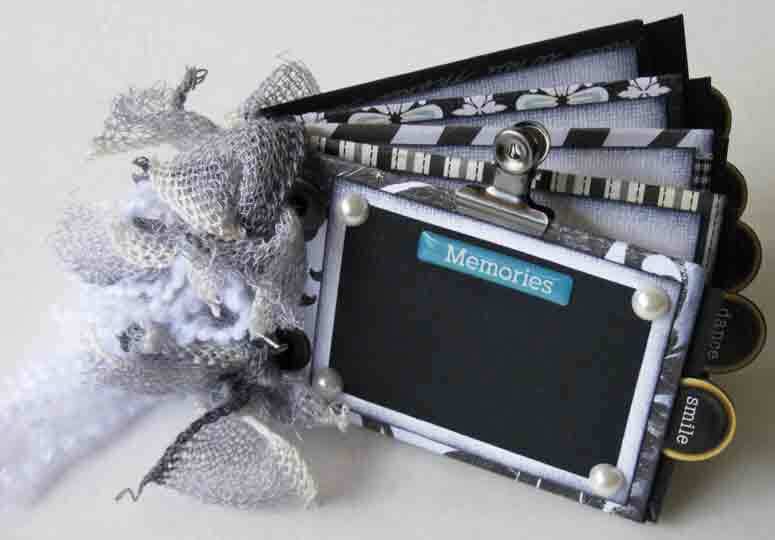 With a black & white theme and tags in each page, you can add lots of photos, messages or memorabilia inside. 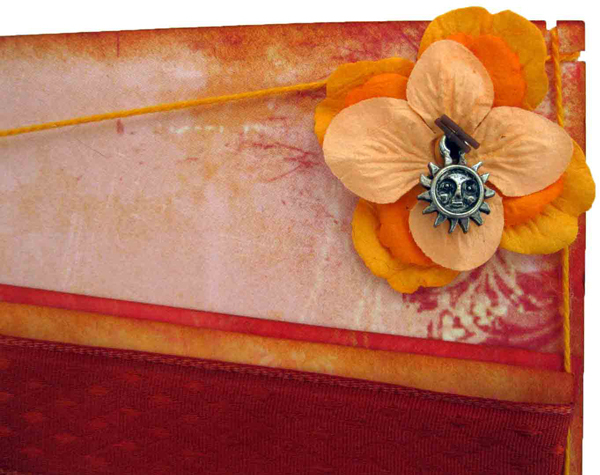 Included in the kit are papers, fibers, stickers, clips, jumbo eyelets, rub-ons and toilet paper rolls! They're even pre-flattened! 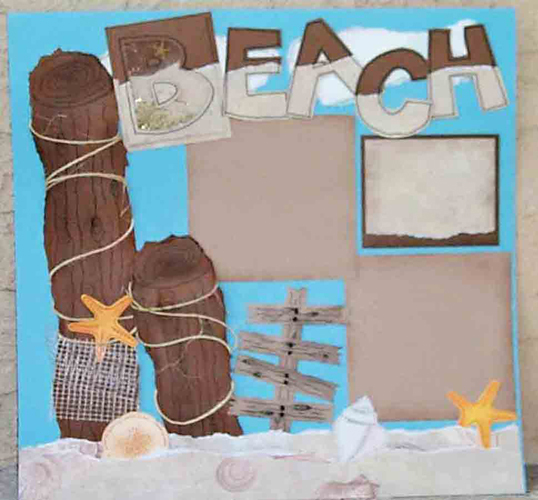 This great beach layout was inspired by my published card of torn mulberry. 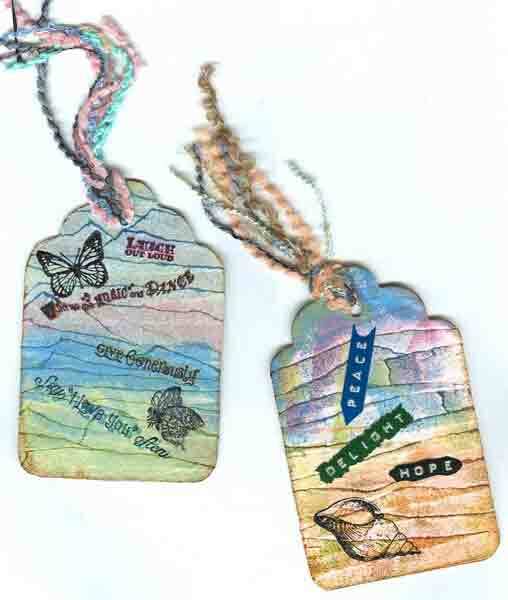 Included in the kit are lots of mulberry papers, rubber stamped beach images to be colored and rope. 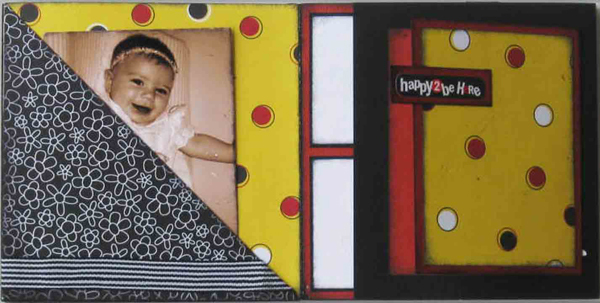 A fun layout made with chipboard frames and "twisted frames" made from patterned paper by Fancy Pants. We'll also make a beautiful new flower technique. 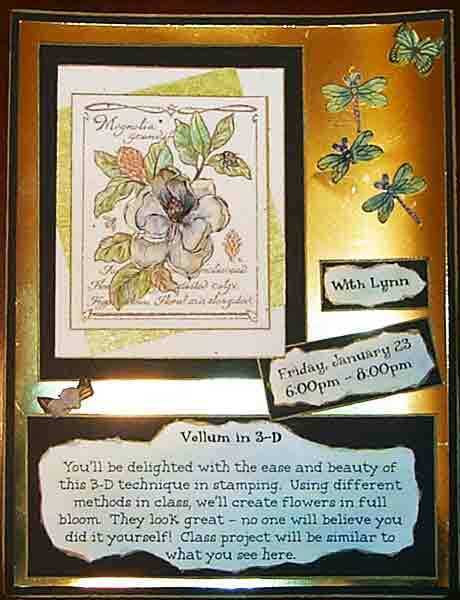 You'll be delighted with the ease and beauty of this 3-D technique in stamping. 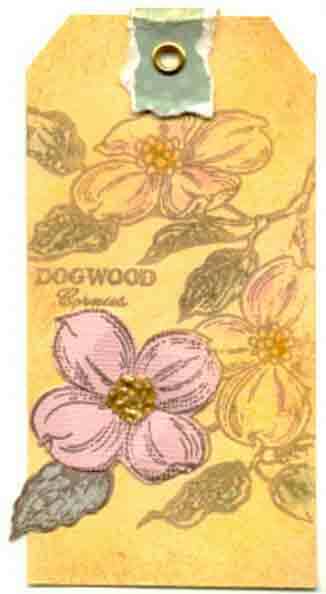 Using different methods in class, we'll create flowers in full bloom. They look really professional and lovely. You'll leave with 2 completed cards. 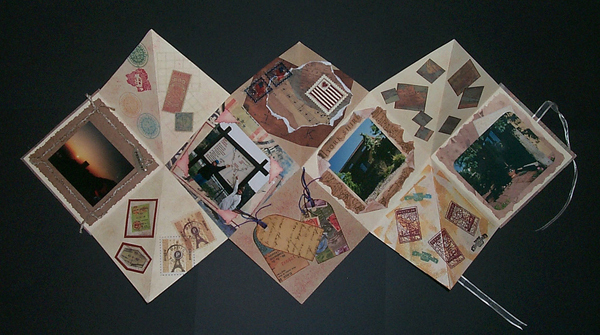 This 2 page layout is beautiful and the kit is easy to make. 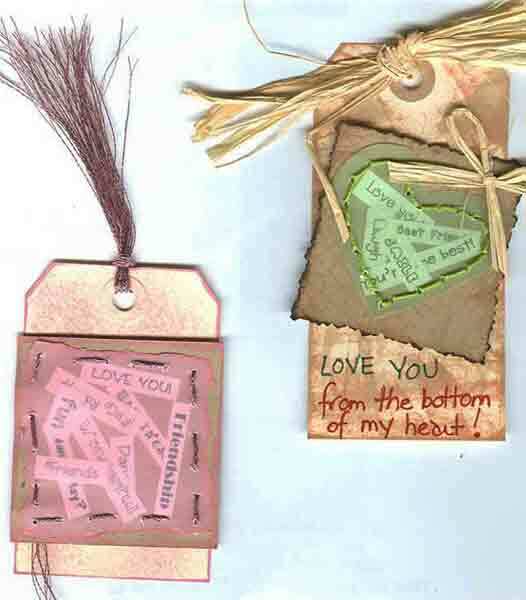 It includes all the pre-cut pieces and all you need to do is "paper piece" them together. If you like, you can also "distress" the edges and add ink for an added element of "artsiness"! 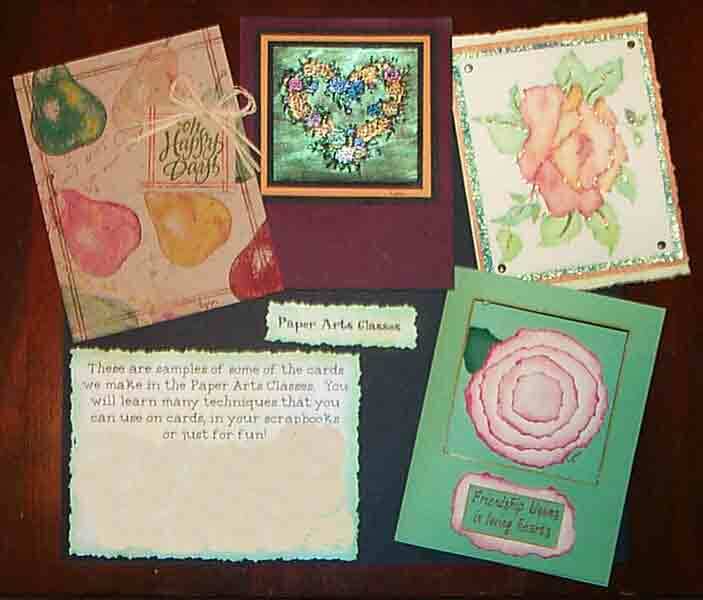 These are samples of some of the cards we make in the Paper Arts Classes. 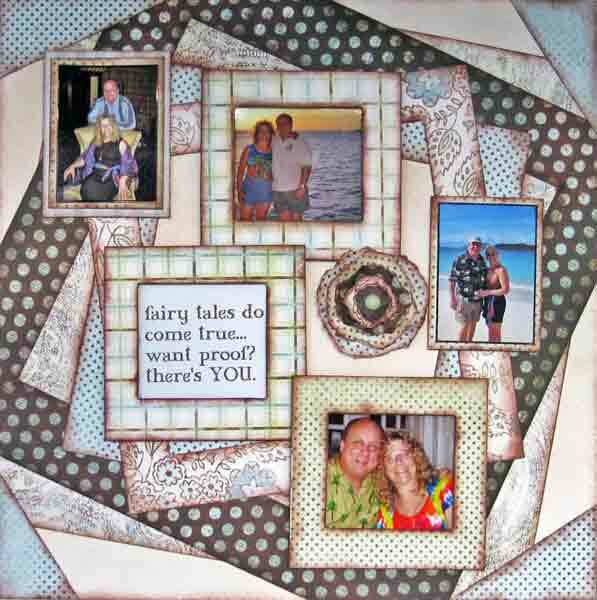 You will learn many techniques that you can use on cards, in your scrapbooks or just for fun! This is a 4 week work shop which meets once a week. Cancellation policy: Since supplies are purchased and kits are made in preparation for each class, we are unable to refund your class tuition. However, if you cancel at least 24 hours prior to the class, you will receive a full tuition credit good towards another class. If you are unable to cancel, but cannot come to the class, you will still receive the class kit with detailed instructions and pictures. Registration is easy by phone, email, or via our store. Payment is accepted in the form of cash, check or credit card. Participants are required to bring a basic kit to all classes. We have personal paper cutters available to beginners for their use, and we have a full line of adhesive (including red line tape) available for sale. 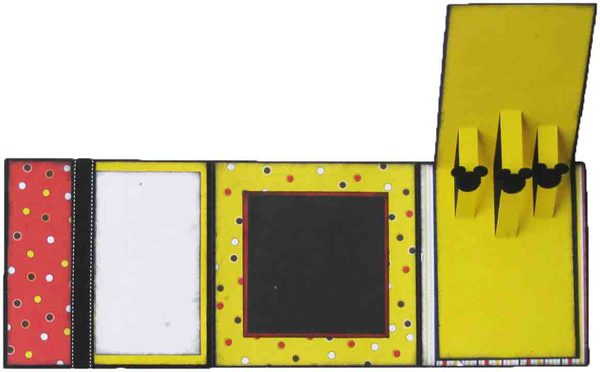 All other class supplies specific to the class are included in the tuition.